© 2001, © 2018 by Paul Freeman. Revised 4/29/18. 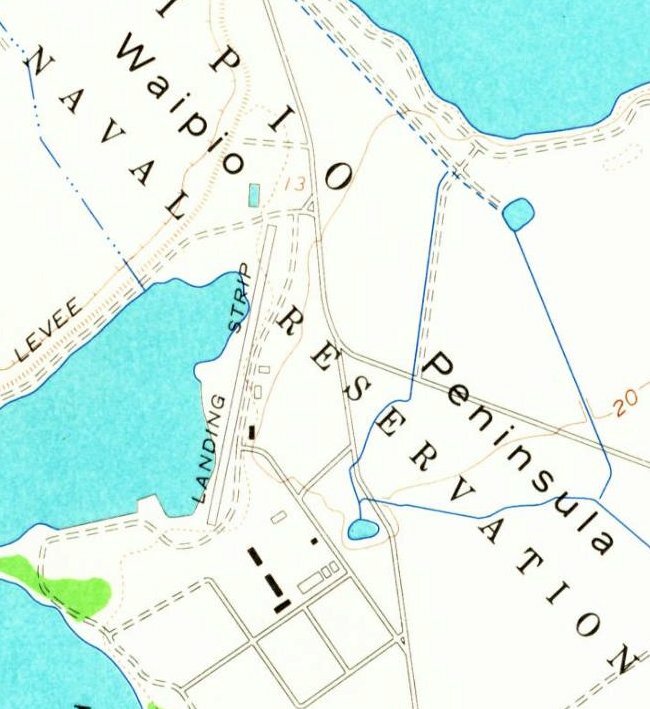 The Waipio Peninsula Naval Reservation Airfield, as depicted on the 1956 USGS topo map. 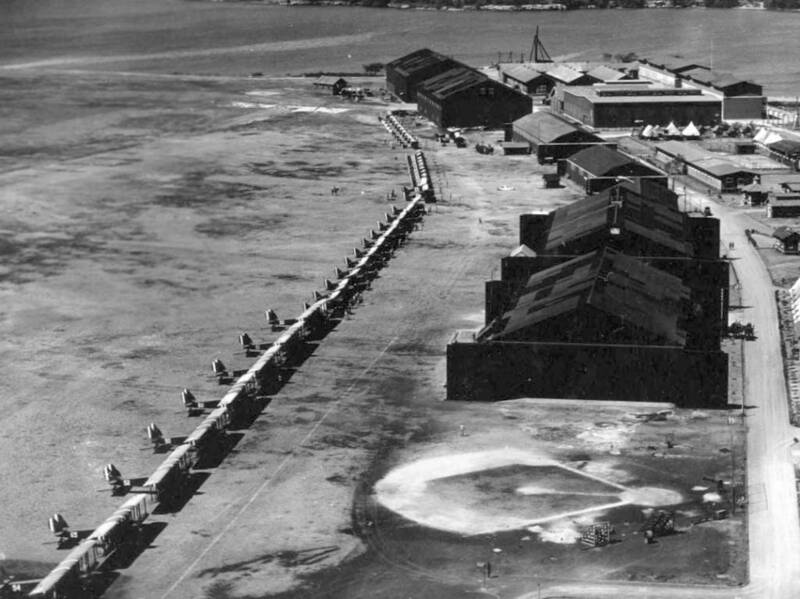 The date of construction or purpose of this small airfield to the west of Pearl Harbor has not been determined. 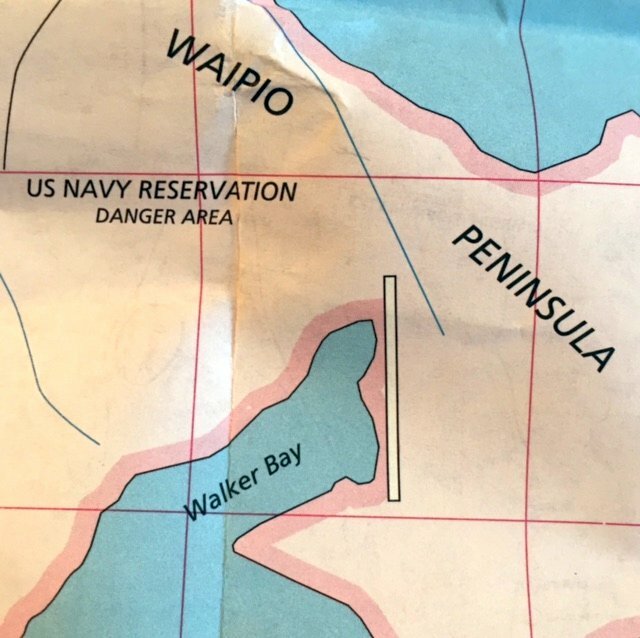 According to the Library of Congress, “Waipio Peninsula was an active part of the Pearl Harbor Naval Base during WWII. The activities that took place here were important to the success of the war efforts in the Pacific. 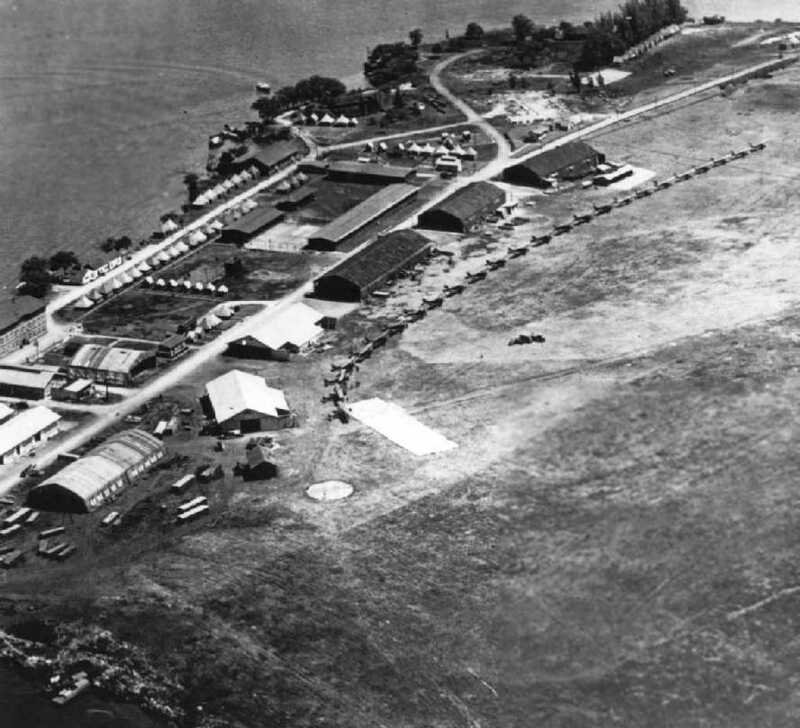 All the Navy functions on Waipio Peninsula contributed to victory, but the Amphibious Operating Base was the most directly involved in the Pacific island-hopping campaigns that helped win the war. 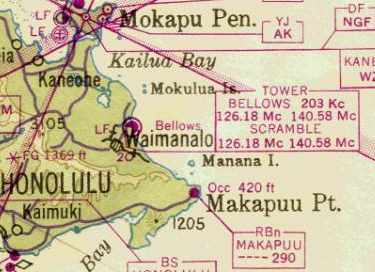 The Waipio Peninsula Naval Reservation Airfield was not yet depicted on the 1953 USGS topo map. 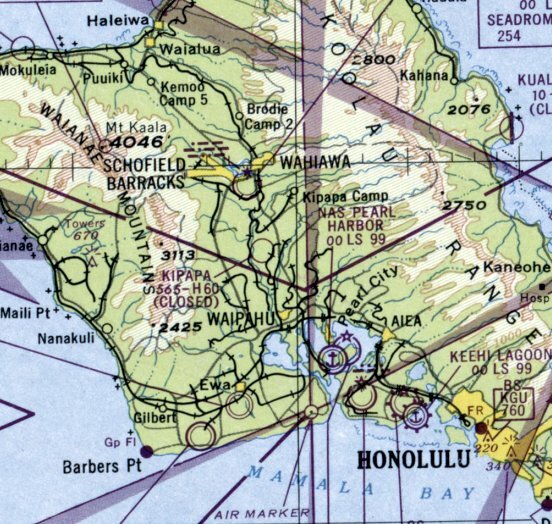 The earliest depiction which has been located of the Waipio Peninsula Naval Reservation Airfield was on the 1956 USGS topo map. It depicted a single northeast/southwest runway directly along the eastern shore of the water, labeled simply as “Landing Strip”. Three small buildings were depicted on the east side of the runway. 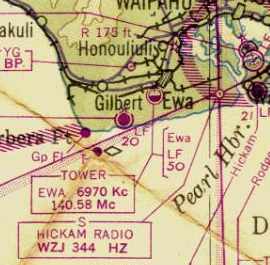 The Waipio Peninsula Naval Reservation Airfield was not depicted at all on the November 1960 Honolulu Sectional Chart (or later aeronautical charts). 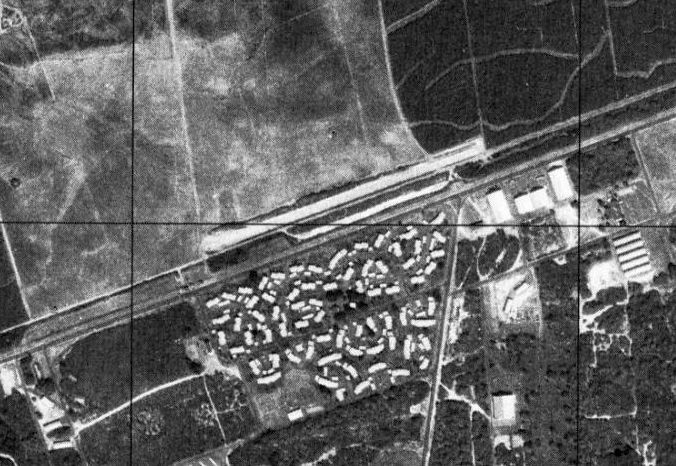 The earliest photo which has been located of the Waipio Peninsula Naval Reservation Airfield was a 1976-78 USGS aerial view. It depicted a single northeast/southwest runway directly along the eastern shore of the water, and a few small buildings on the east side of the runway. 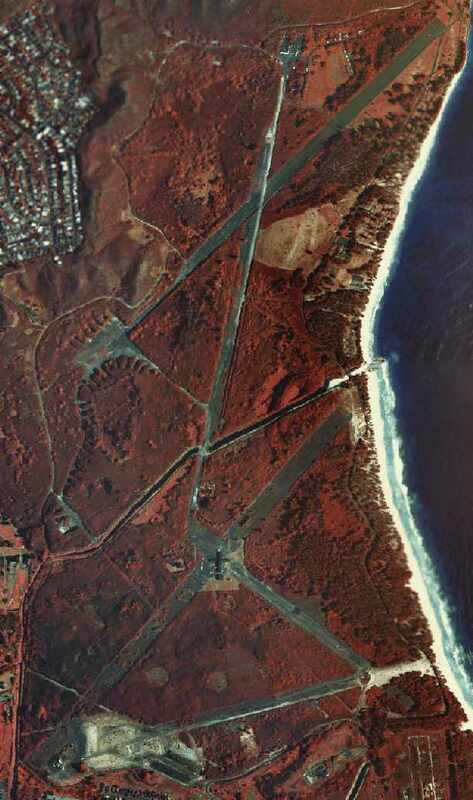 A 1985 USGS aerial view showed the Waipio Peninsula Naval Reservation Airfield's paved runway remained recognizable. 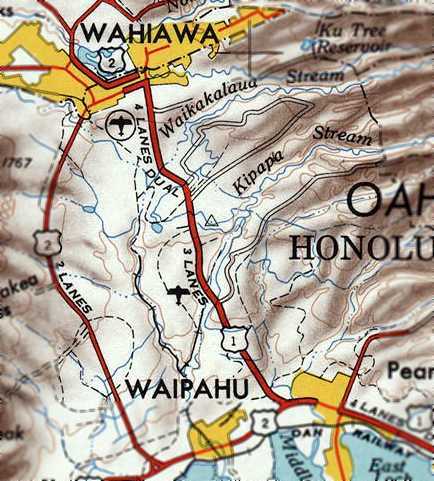 A 1998-99 road map (courtesy of Kevin Walsh) depicted the Waipio Peninsula Naval Reservation Airfield's runway, but without any label. A 2013 aerial view looking northwest at the site of the Waipio Peninsula Naval Reservation Airfield showed a dramatic difference since 1985, with the airfield being very overgrown & barely recognizable. 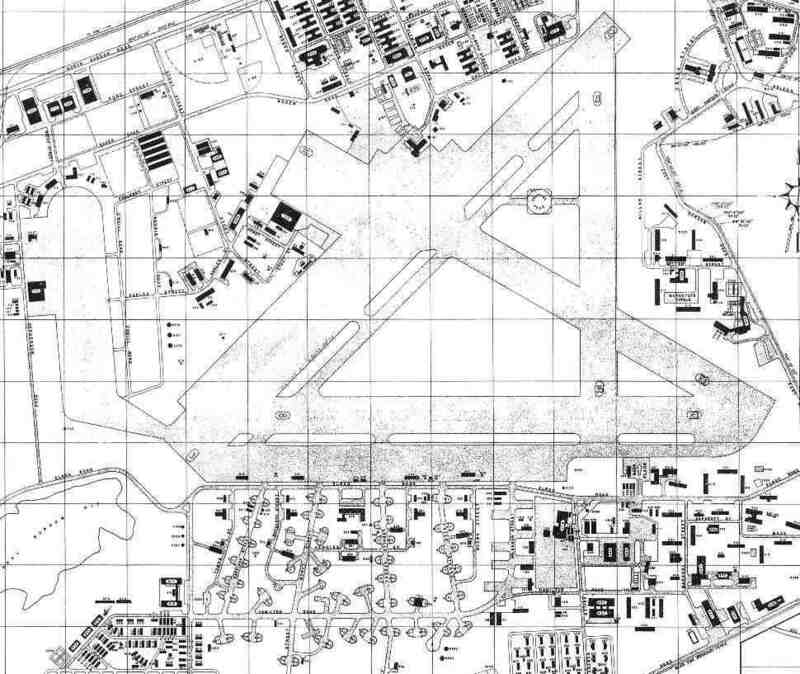 The earliest depiction which has been located of Murray-Air Kapolei Airfield was on the 1968 USGS topo map. Not much is known about this former cropduster airfield, including its name or date of construction. nor on the December 1968 Hawaiian Islands Sectional Chart (nor later aeronautical charts). less than a half-mile northeast of NAS Barbers Point & a half-mile northwest of MCAS Ewa. The runway was labeled simply as “Landing Strip”. 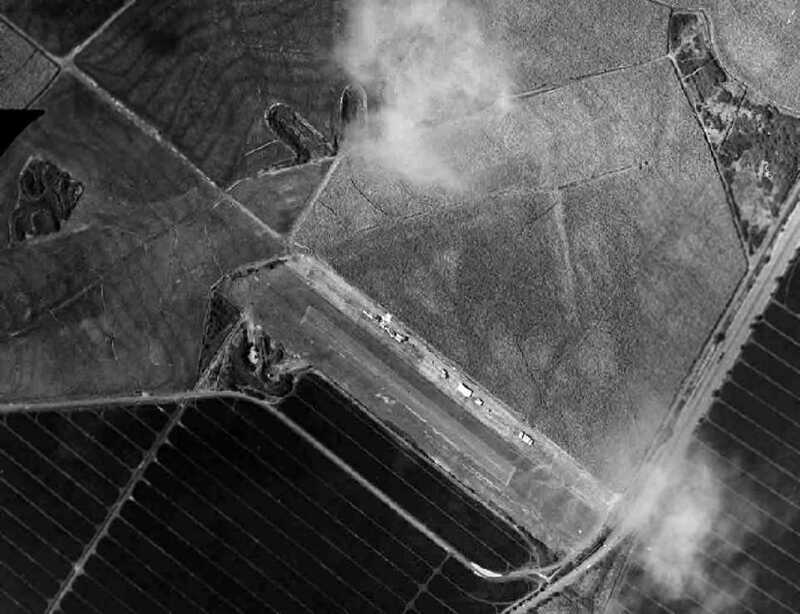 The earliest photo which has been located of the Murray-Air Kapolei Airfeild was a 2/6/68 USGS aerial view. which depicted a single northeast/southwest runway located directly adjacent to the north side of Roosevelt Avenue. 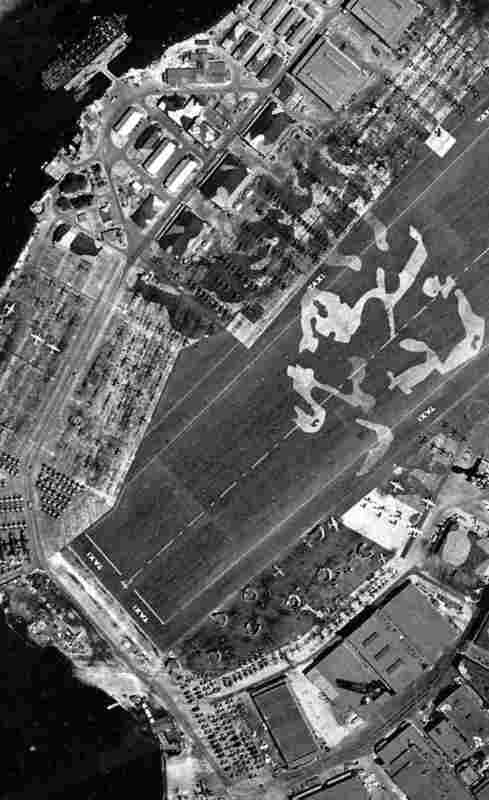 The last photo which has been located of the Murray-Air Kapolei Airfeild was a 1977 USGS aerial view. Alan Miller recalled, “The field shown as Kapolei Airfield was a cropduster strip for Murray-Air. I flew out of the Navy flying club at Barbers Point, we did not use the Kapolei field. which still labeled it as “Landing Strip”. 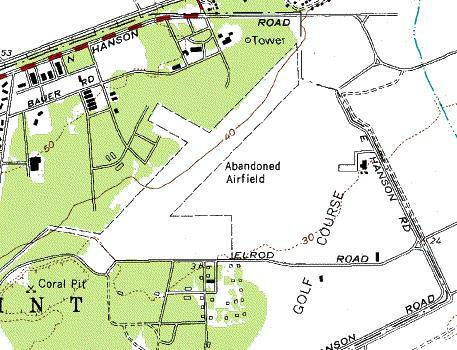 The Murray-Air Kapolei runway was no longer depicted on the 1998 USGS topo map. with the property having been cleared. 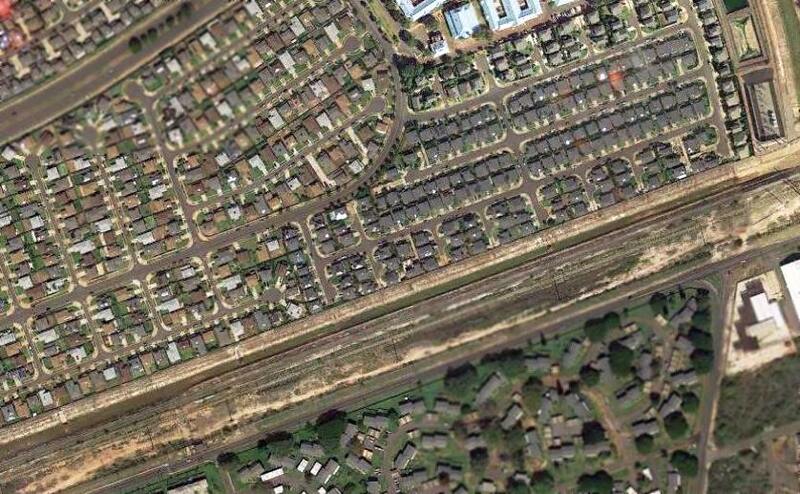 A 2013 aerial photo showed no trace remaining of Murray-Air Kapolei Airfield, with the property having been covered by houses. The site of Murray-Air Kapolei Airfield is located northwest of the intersection of Roosevelt Avenue & Coral Sea Road. but it misspelled the field as “Kapapa”. A careful survey was made of the entire Island of Oahu in 1940 for sites on which landing fields could be constructed. or the turbulence in the air created by the close proximity of mountain ranges precluded such development. 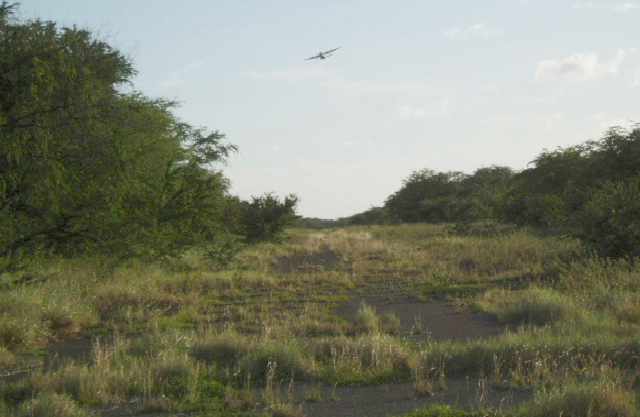 The Kipapa Gulch area was the only site remaining where an airfield could be constructed. was selected because it could accommodate two 5,000' runways free from obstructions. But 2 reasons precluded the use of the area initially. which would further increase the congestion of the air over that part of the island. Secondly, it would remove from cultivation a highly productive tract of land. rather than as a station for Army pursuit aviation. on the south side of the island of Oahu including Barber's Point, Kipapa Gulch, and Ford Island. it lent itself to aerial traffic regulations which would be difficult to attain if large numbers of airplanes of the 2 services were intermingled. in that the site was readily accessible to the parent vessels of the carrier groups. It facilitated in the transfer of personnel & supplies to & from the parent vessels in Pearl Harbor. Lastly, It was advantageous in making for ease of supervision of the training of all carrier-based Naval aviation. 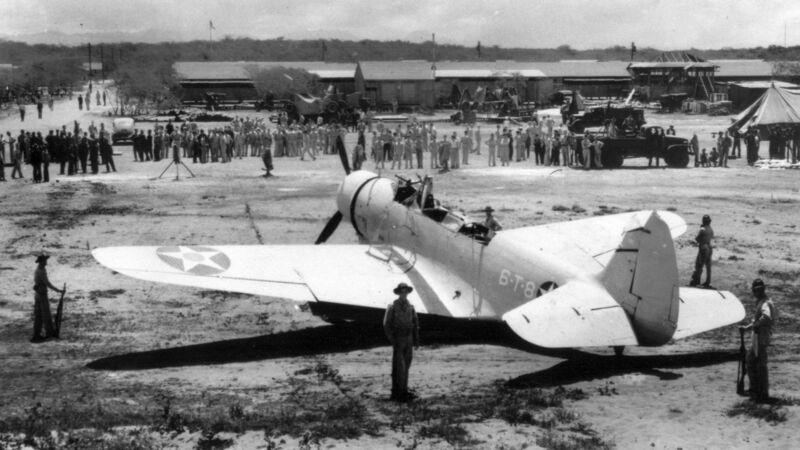 But it was not until some time after the United States entered World War II that Kipapa Airfield was developed. The date of construction of the Kipapa airfield has not been determined. Kipapa means “Paving the Way” in Hawaiian. This airfield served to pave the way for many military units going overseas. A World War II veteran said the place was just cut out of the sugarcane patch. During the war it apparently saw little use by the Navy due to the fact that carrier aircraft were constantly deployed during the war. 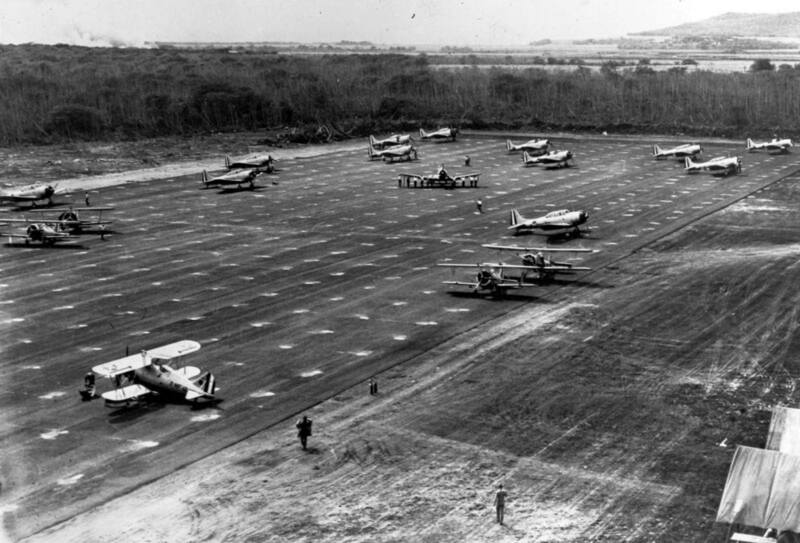 The Army Air Corps became the principal user of the airfield by default. 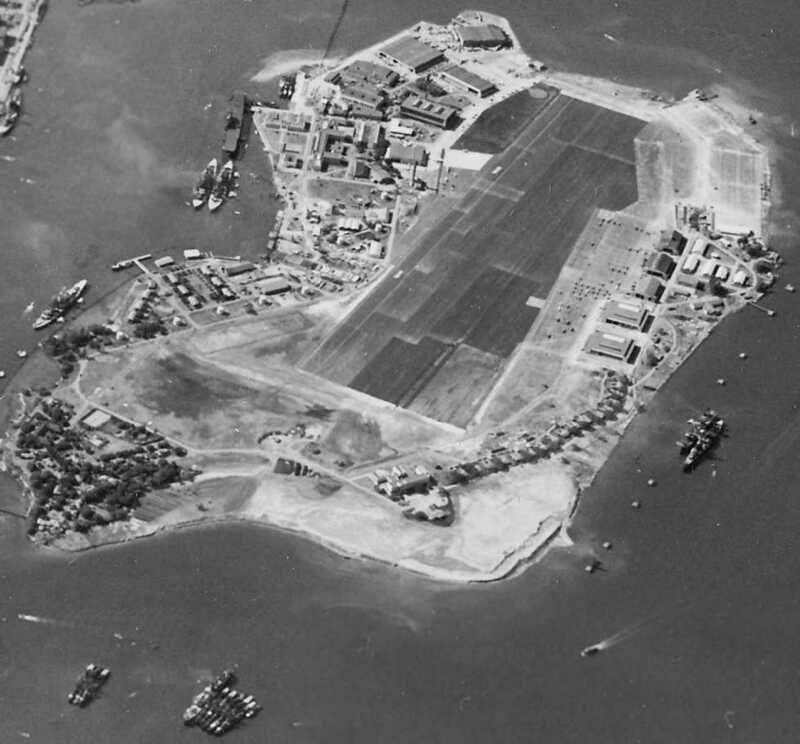 Kipapa Field was a major transiting point for units going overseas. Aircraft from this airfield searched & patrolled over the surrounding Pacific area, maintaining a 24-hour vigil to avert any attack. 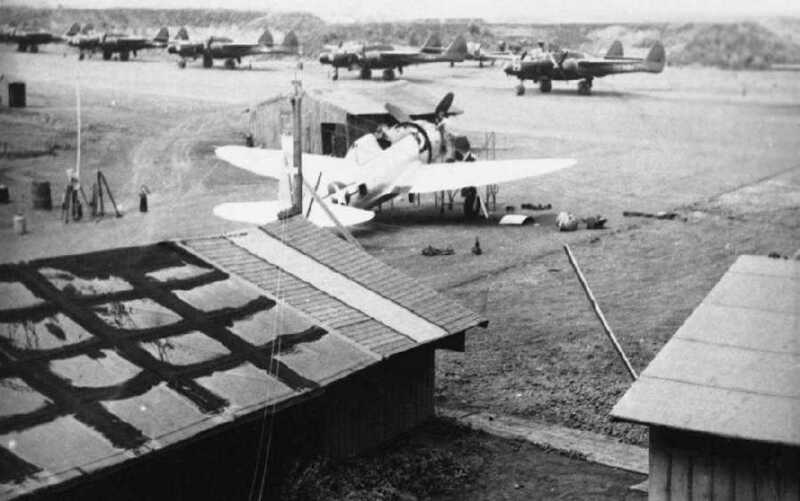 A large number & variety of squadrons are documented to have been stationed at Kipapa Airfield during World War II. with B-17s & B-18s on May 23, 1942 until September 9, 1942 when they moved to Kualoa Airfield. from the mainland United States with B-24s & began flying their first missions by November 1942.
on November 2, 1942 from the mainland United States with B-24s & flew sea-search missions between November-December 1942. The 18th Fighter Group, 6th Fighter Squadron, moved from Kahuku Airfield to Kipapa Airfield with P-70s on November 17, 1942.
flying F-5s was based at Kipapa Airfield in July 1944.
was kept on alert with 500-pound bombs at Kipapa Field during the time that the Battle of Midway was in progress. flying P-61 Black Widow night fighters performing training & defense duties. P-40B, P-40F, P-70, P-61A, P-61B, and C-46D, because all were involved in accidents in the area. with numerous aircraft dispersal pads surrounding the runways. No buildings were depicted on the field. Note also the proximity of Wheeler Field @ Waieli Strip to the north. 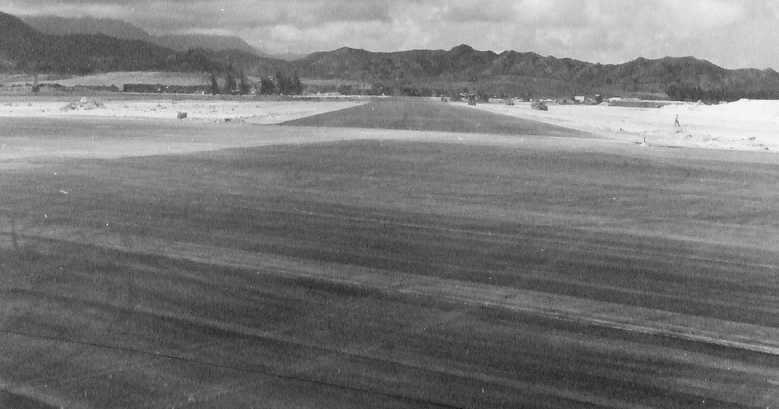 The earliest photo which has been located of the Kipapa Airfield was a 9/17/44 U.S. Navy aerial view looking south (courtesy of Brian Rehwinkel). 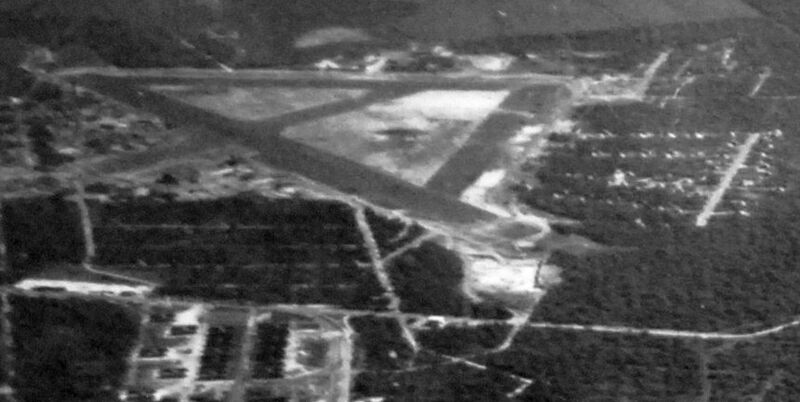 The airfield was depicted as having 2 paved runways, with several hardened aircraft parking revetments along either side of the longest runway. Note also the sharp dropoff of the gulch right at the far end of both runways. A 1945 photo of numerous Northrop P-61 Black Widow night fighters at Kipapa Field. with a row of Northrop P-61 Black Widows in the background. 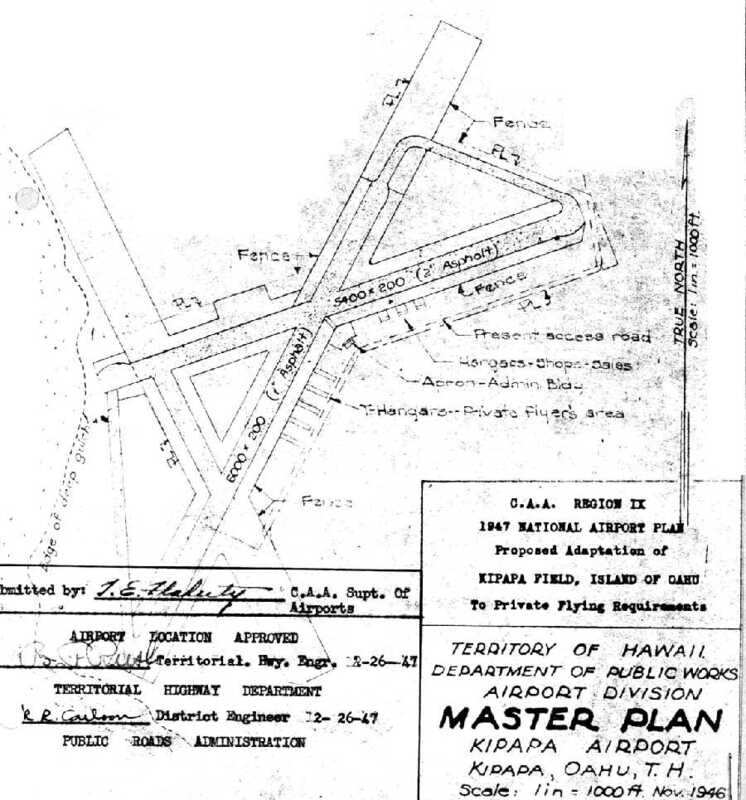 A 1947 CAA plan of a “Proposed adaption of Kipapa Field to private flying requirements”. It depicted a 6,000' asphalt northeast/southwest runway & a 5,400' east/west runway, as well as a apron, administration building, and T-hangars. The 3rd runway would have been partially reused as a taxiway. 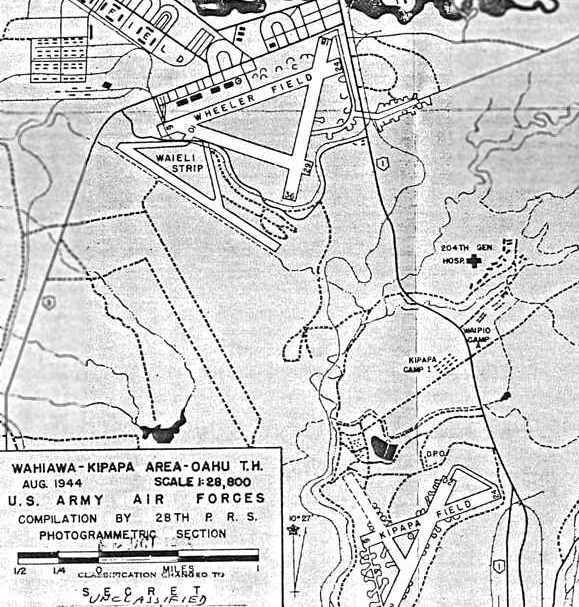 The Spetember 1947 Hawaiian Islands Sectional Chart depicted Kipapa Field as a closed airfield having a 6,000' paved runway. while numerous objects (military?) were stored on the northeast/southwest runway. 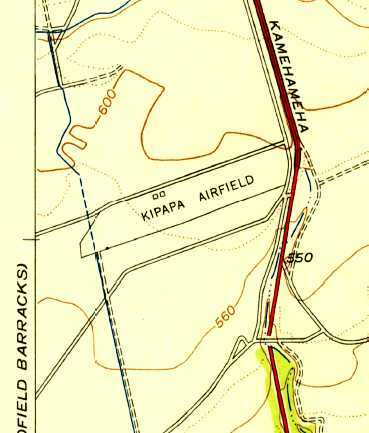 Kipapa Field was still depicted on the 1951 USGS topo map. 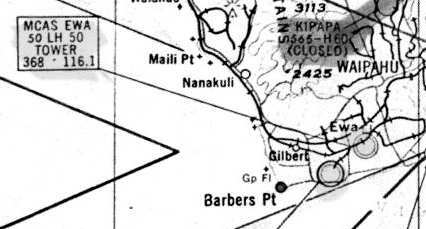 The 1954 USGS topo map only depicted “Kipapa Airfield” as occupying a small minority of the former airfield: just the northeastern half of the northeast/southwest runway. showed several light aircraft & small hangars along a short portion of the east/west runway. It appears as if the former northeast/southwest runway pavement had been removed. 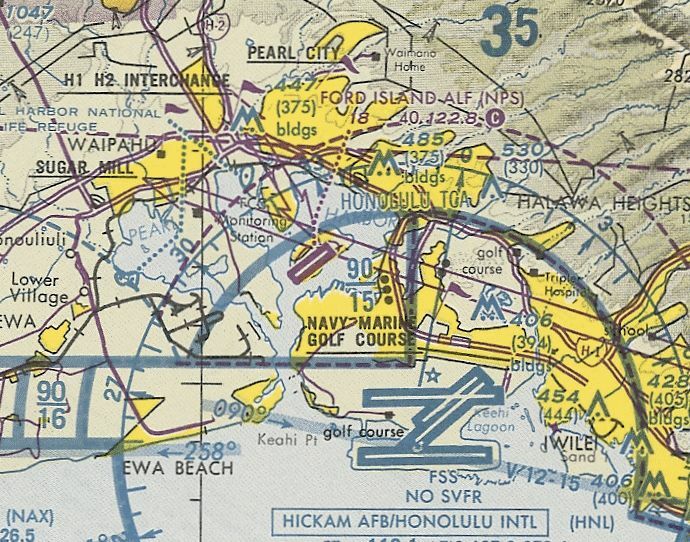 The only aeronautical chart depiction which has been located showing Kipapa Field as open was on the November 1960 Hawaiian Islands Sectional Chart. Only a short portion of Kipapa's runway was being reused, as it depicted Kipapa as having a mere 1,600' paved runway. as it was no longer depicted on the 1961 Honolulu Sectional Chart. but that doesn't indicate the field was still open at that point. but there was no sign of any recent aviation use. 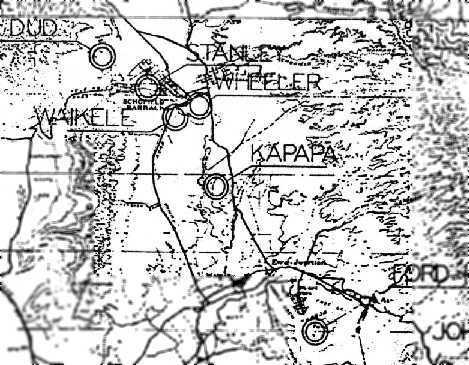 A 1967 water supply geological survey map listed Kipapa Airfield but had no other information. 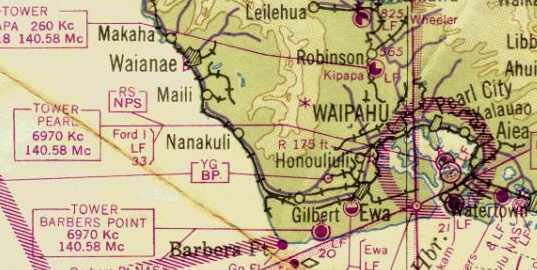 The 1968 USGS topo map no longer depicted any trace of the Kipapa runways. 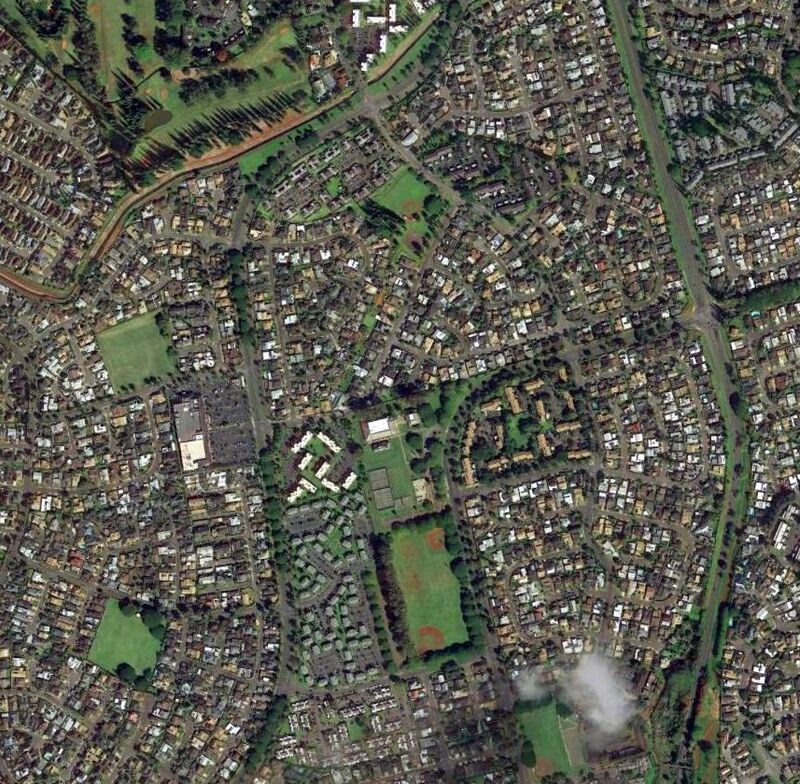 and the property became a Mililani Town housing development. The airfield site is located south the Mililani Golf Course between Meheula Parkway & Hokuala Streets. unfortunately, there are no indications of the site's military history. The residents in the area would be surprised to learn that they now live on the site of an historic World War II airfield. 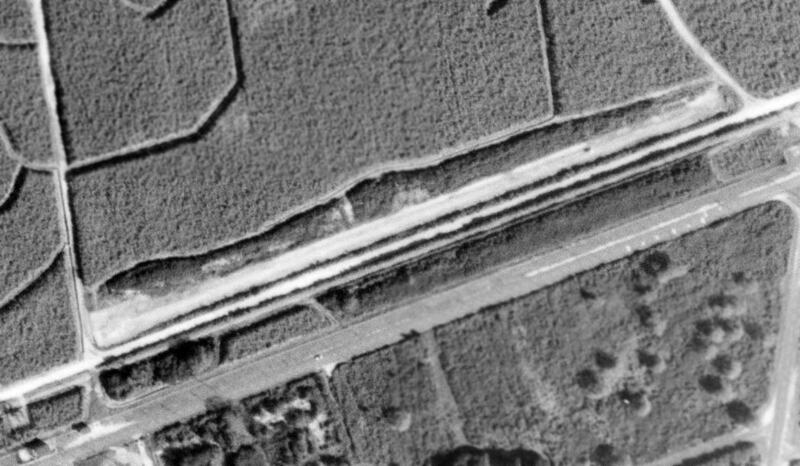 A 2000 USGS aerial view showed no trace remaining of Kipapa Airfield. A 2013 aerial photo showed that no trace remains of Kipapa Field. 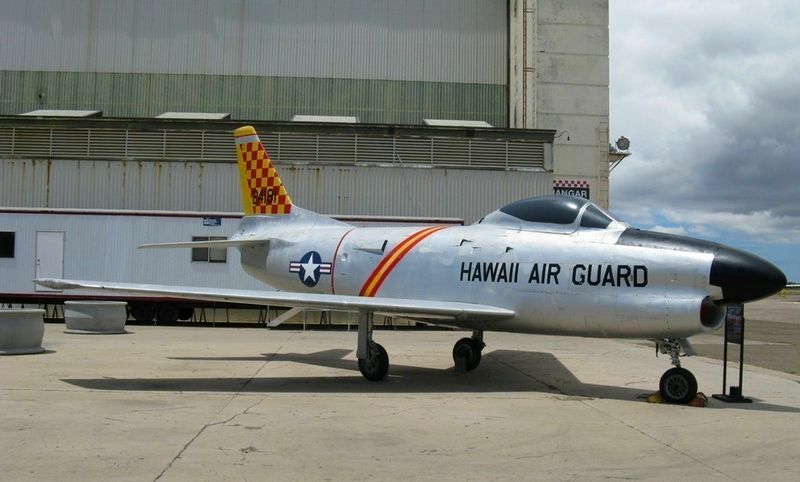 (courtesy of Colin Perry of the Hawaii Aviation Preservation Society). The Navy secured a lease to a 700 acre tract at Ewa in the early 1930s. There it built a dirigible mooring mast & a 1,500' oil-surfaced emergency landing field. Ewa was made available for Marine Corps aircraft use in 1939. The Navy purchased an additional 3,500 acres for Ewa in 1940. 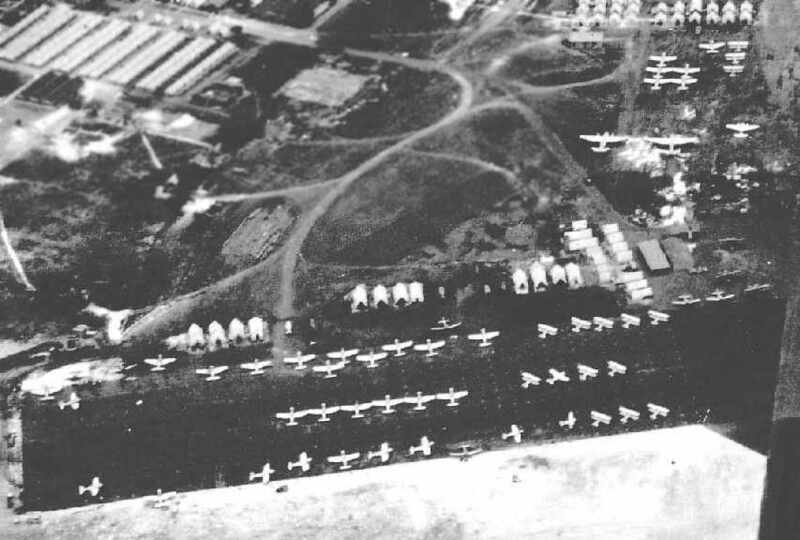 A 1941 aerial view of a variety of biplanes & monoplanes at Ewa Field (courtesy of John Voss). 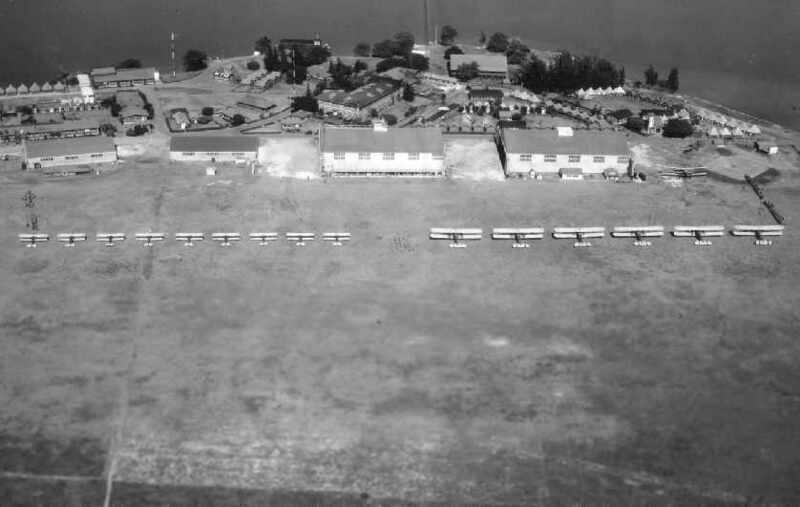 A circa 1941 aerial view of a TBD Devastator torpedo bombers & other aircraft at Ewa Field (courtesy of John Voss). The burning wreckage of a Marine Corps Douglas SBD Dauntless dive bomber pictured at Ewa Mooring Mast Field after the Japanese attack on 12/7/41. 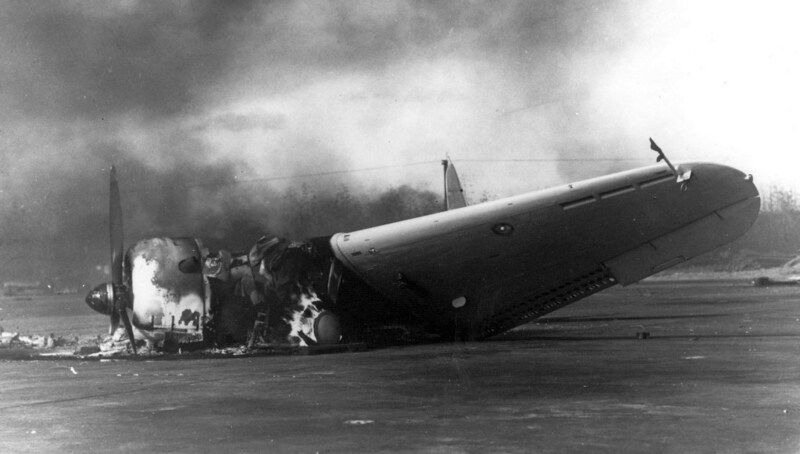 On 12/7/41, Japanese aircraft struck Ewa before hitting Pearl Harbor. 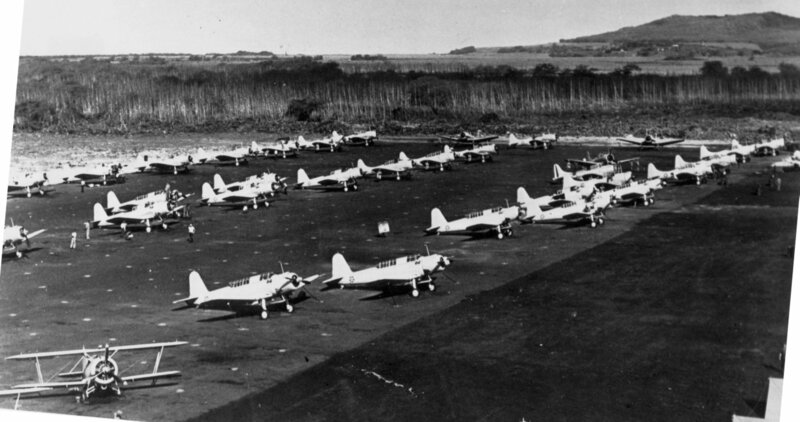 All Marine Corps aircraft at Ewa (a total of 48) were destroyed in the course of the attack. 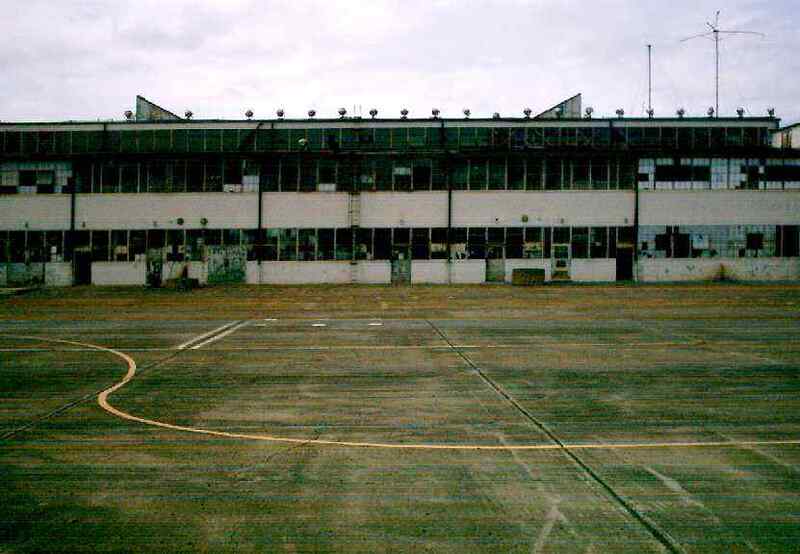 a total of 4 runways had been constructed at Ewa, along with buildings & hangars. The skeleton of a burned-out SB2U-3 Vought Vindicator sits on the tarmac at Ewa after the Pearl Harbor attack. Marine guards posted around a damaged TBD Devastator torpedo bomber at Ewa Field (courtesy of John Voss). and it was involved in a mid-air collision with another Torpedo 6 TBD off the coast of southwest Oahu prior to the Japanese attack on Pearl Harbor. The landed at Camp Malakole near Barbers Point & was being guarded by members of the federalized 251st Coast Artillery (AA) Regiment of the California National Guard. Fueling a F2A-3 Brewster Buffalo in a camouflaged revetment at Ewa in 1942.
showed the field to have 4 paved runways. A WW2 photo of Grumman TBF Avengers parked in concrete revetment hangars at Ewa (courtesy of John Voss). Throughout the course of WW2, Ewa served as a staging base & a training facility. 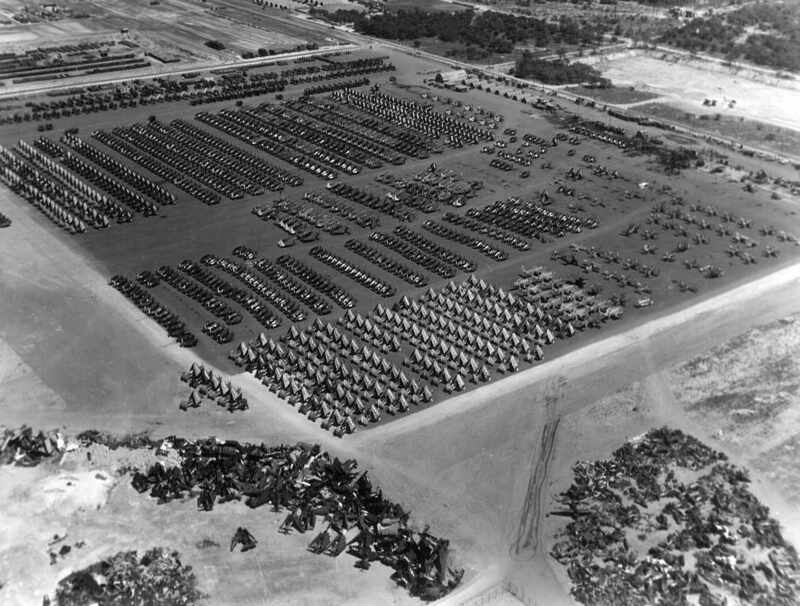 A December 1944 National Archives aerial photo of Ewa, showing large numbers of aircraft on the west & south sides of the field. 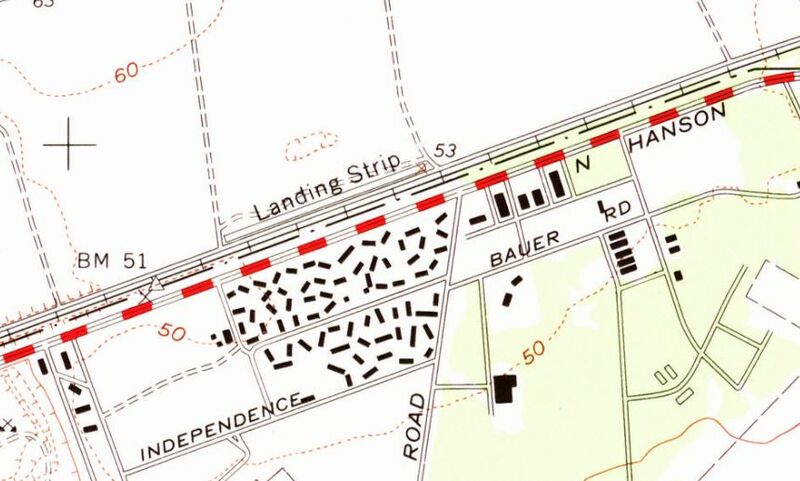 showing 3 paved runways, a large paved ramp, and an elaborate quantity of aircraft revetments on the south side. depicted the airfield at Ewa as having a control tower. Following WW2, Ewa continued to be used by the Marine Corps. Grumman F7F Tigercats at MCAS Ewa, circa 1948, by Lowell Malliett. 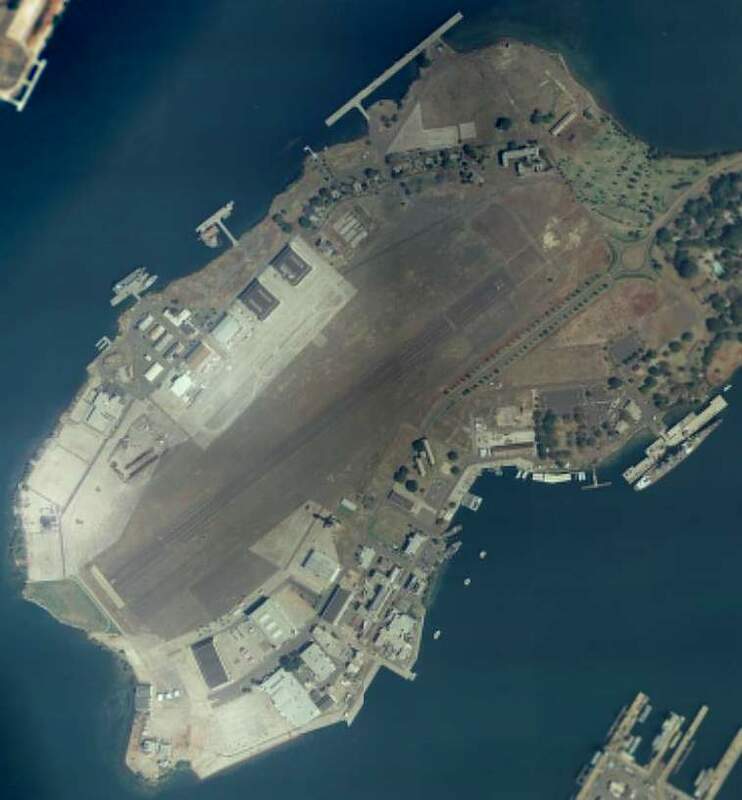 and the close proximity of NAS Barber's Point ruled out any extension of Ewa's runways. and Ewa was declared excess & disestablished in 1952. 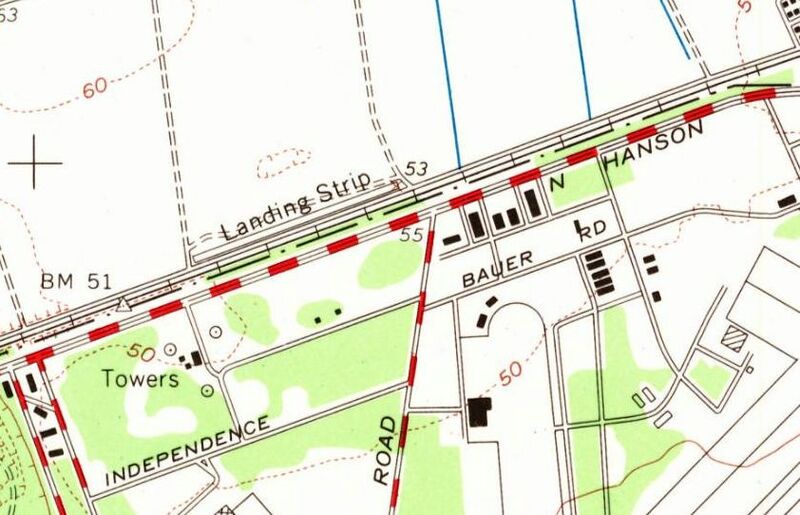 The airfield's property was absorbed into NAS Barber's Point. The vast majority of the buildings of the former Marine Corps base were taken down in subsequent years. 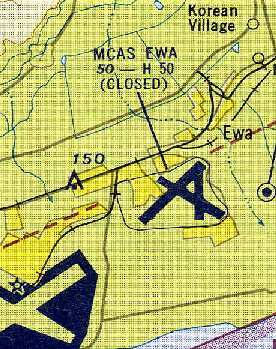 The intact airfield of MCAS Ewa was still depicted on the 1953 USGS topo map, but the facility was unlabled. 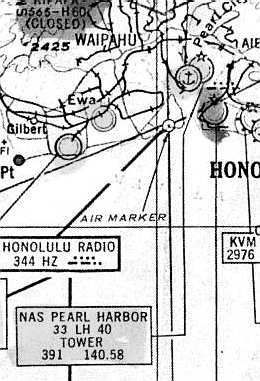 in the airfields diagram on the October 1954 Hawaiian Islands Sectional Chart (courtesy of Chris Kennedy). It was shown as having 3 paved runways, with the longest being 5,000'. but the field was labeled "closed". The longest runway was listed as 5,000'. 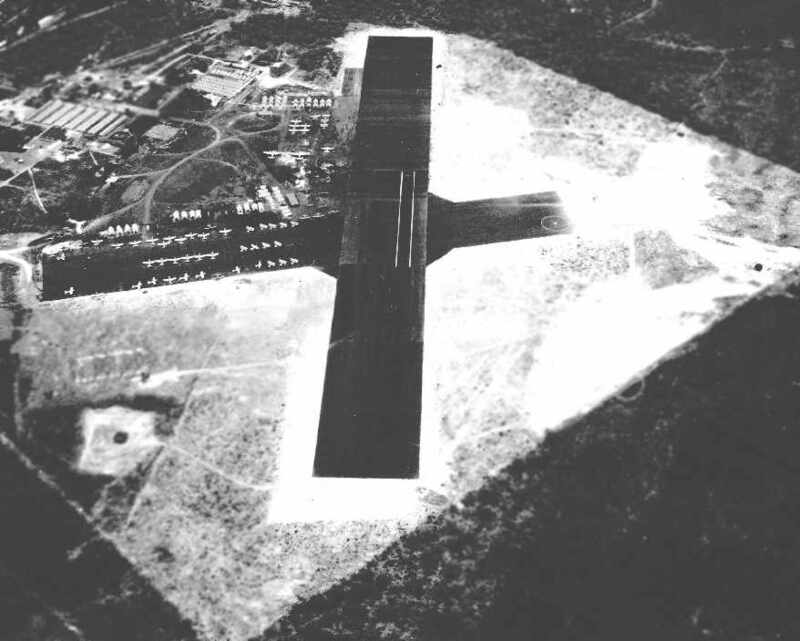 A 1962 aerial view still showed runway markings painted on the ends of the mostly-intact Ewa runways. Two Curtiss P-40 Warhawks being pulled out of the concrete revetment hangars at Ewa during the filming of the 1970 movie “Tora Tora Tora” (courtesy of John Voss). According to Tom Kramer, "I was on that site many times in the early 1970s. It was the Barbers Point NAS Golf Course. The fairways were built around the concrete runways & taxiways. When a ball sliced or hooked off the fairway & hit them, it went forever into the brush. and I used to go back & find golf balls all over the place. I was never able to get back in there to see if they are still there. However, Barber's Point NAS just closed but not built over, so I would assume they still are." A 1977 USGS aerial photo depicted most of the runways of MCAS Ewa remaining intact, but a golf course had covered the southeast corner. along with much smaller lengths of 2 other runways. 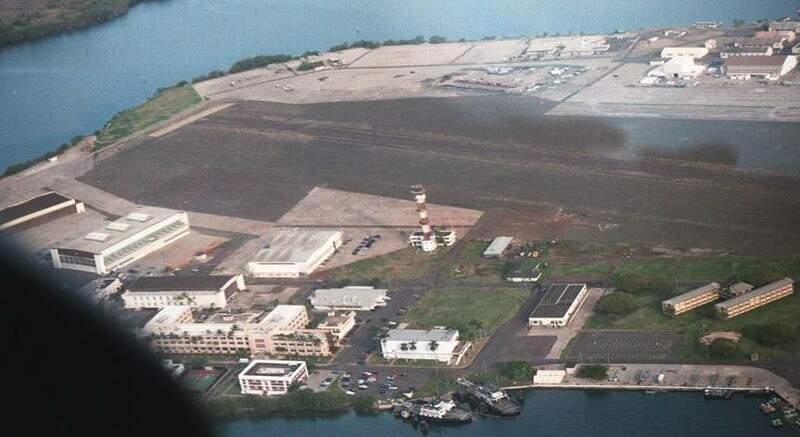 "MCAS Ewa, or what is left of it, is at the east end of the NAS Barbers Point complex. Still visible from the air is one of the old runways." A 2003 photo by CW2 Matt Hobbs of the remains of a runway at Ewa (with a Coast Guard C-130 in the background). A 2003 photo by CW2 Matt Hobbs of a concrete revetment hangar which remains intact at Ewa. "I live in Ewa Beach, and my wife & I were driving around what used to be MCAS Ewa. 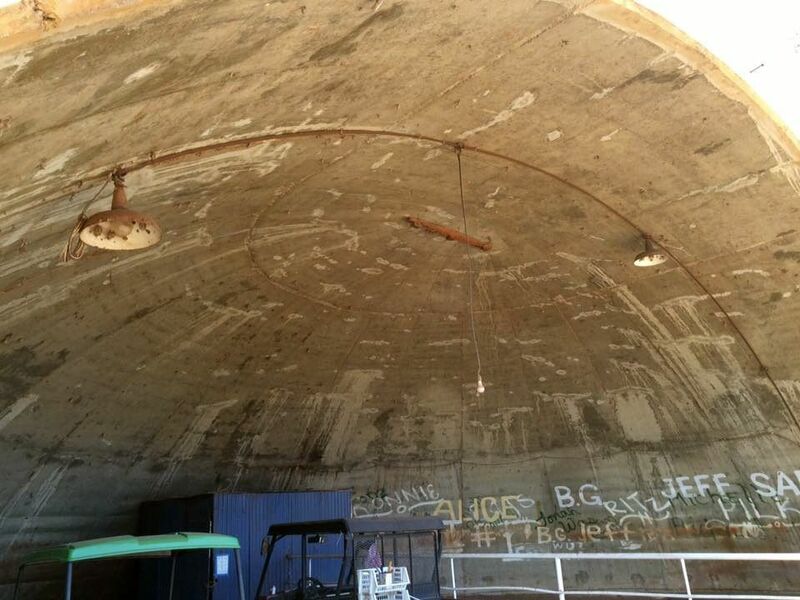 The old concrete hangars are still there, and in excellent condition. Some are being used as horse stables, but the majority are empty. The concrete hangars are in rows along overgrown taxiways. and dragged the remains of a Douglas Dauntless out of the scrub brush out there. Pretty amazing to think it sat out there for all of those years." 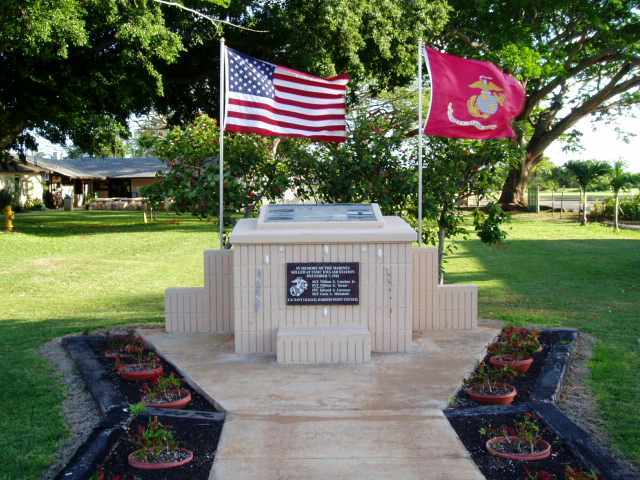 A 2003 photo by CW2 Matt Hobbs of a memorial at Ewa. 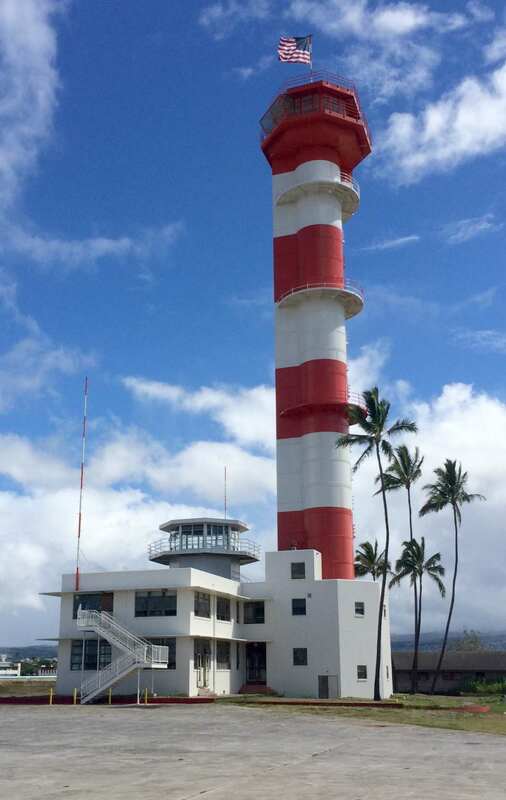 although NAS Barber's Point was turned over to the state (it is now the Kalealoa Airport). and has photos from that day." A 2013 aerial view looking north shows that asphalt pavement remains of at least 2 former runways at Ewa. 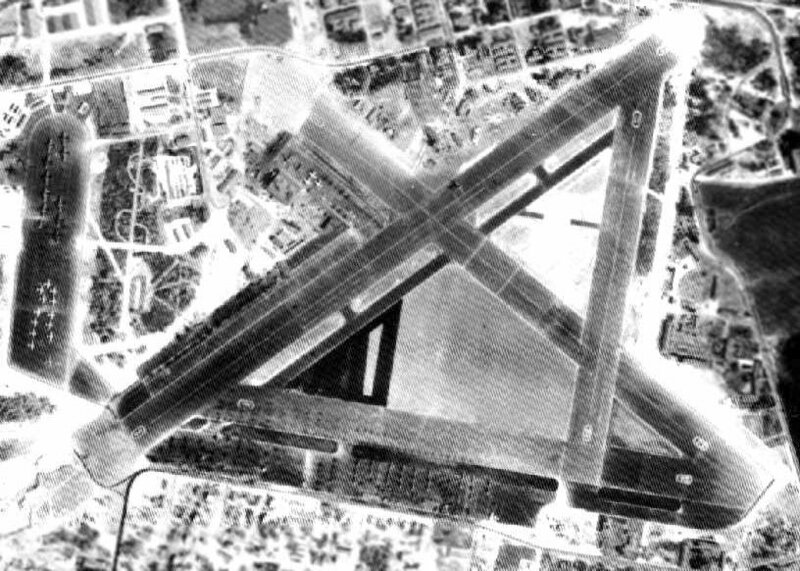 Note at least one closed-runway "X" which is still visible on the runway pavement at the bottom-center. A 2016 (or earlier) photo of the interior of a concrete revetment hangar which remains intact at Ewa. A 2016 (or earlier) photo of the back side of an Ewa concrete revetment hangar from which the earthen covering has been removed. See also: United States Marine Corps Air Stations of World War II. 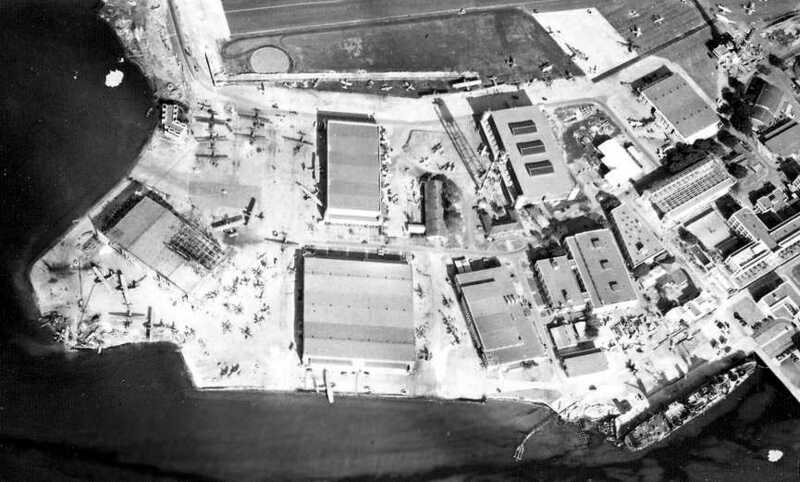 A December 16, 1918 aerial view of the 6th Aero Squadron facility at what was originally known as the “Joint Services Flying Field” on Ford Island. and an airfield was first built by the Army in 1918.
of the 6th Aero Squadron facility at what was originally known as the “Joint Services Flying Field” on Ford Island. and a row of tents northeast of the hangars. At some point the airfield was renamed Luke Field. 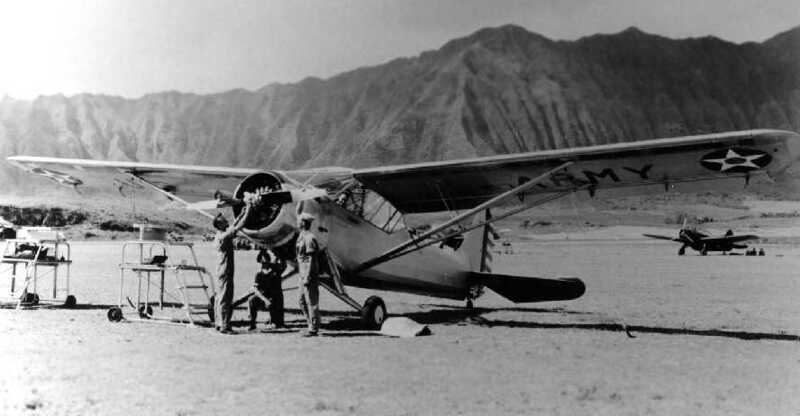 Navy aircraft arrived at Ford Island in 1919. 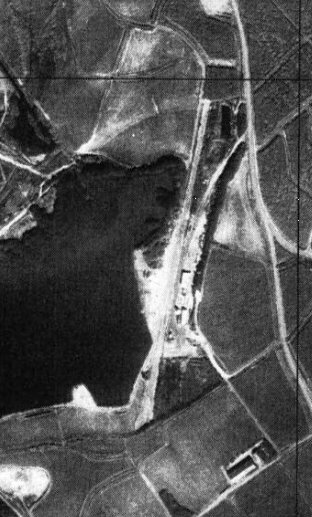 A 1919 aerial view looking east at the of the Luke Field Amphibian Base, showing 2 hangars & 2 seaplane ramps. 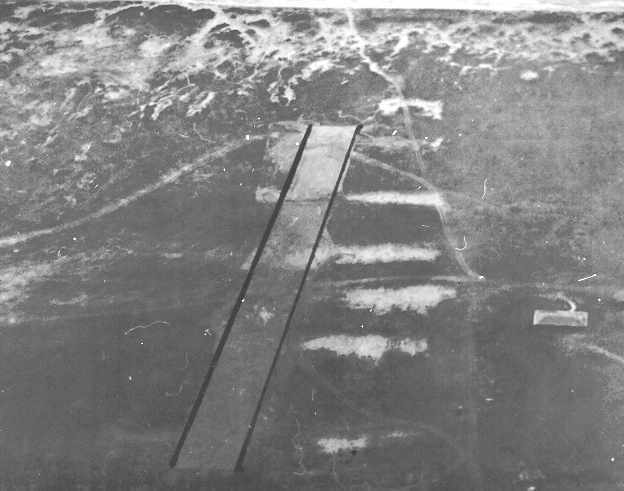 A circa 1919-21 aerial view looking north at Luke Field, showing a line of DH-4 & JN-4/6 biplanes. Just in front of the aircraft is the field's compass rose, and at lower left are aircraft packing crates. 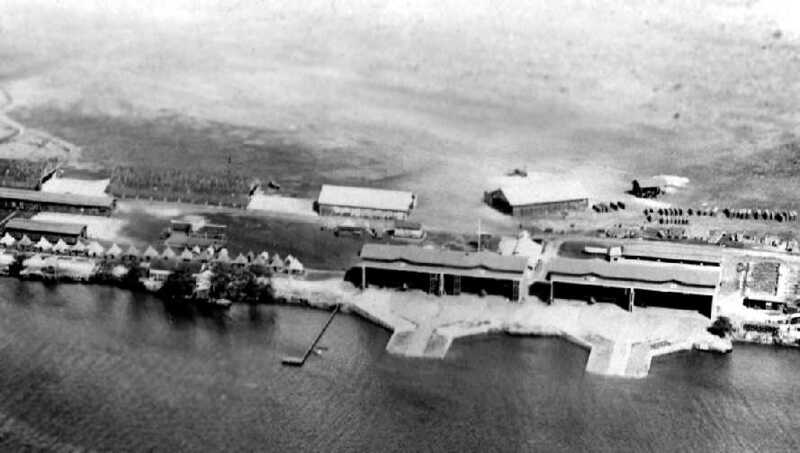 The Navy's Air Station on Ford Island was commissioned in 1923. 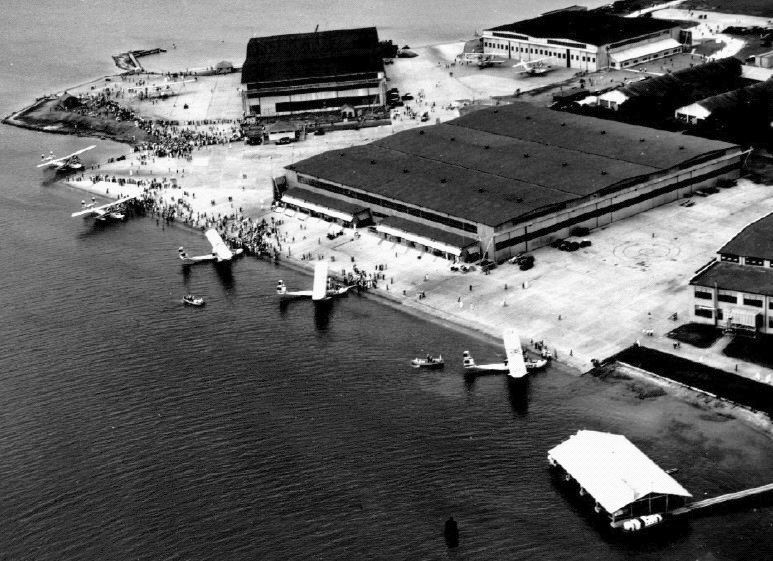 The runway was completed in 1925.
with the Army's Luke Field having 4 hangars on the left, and the Navy having at least one seaplane hangar on the right. 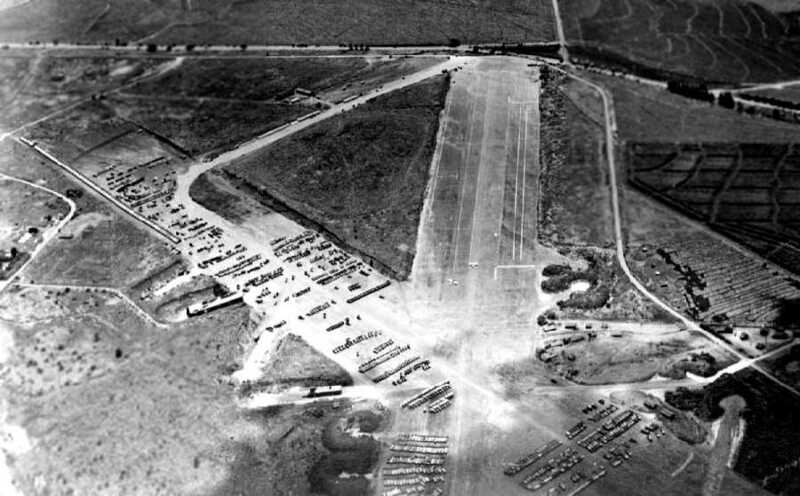 A 4/18/25 aerial view looking along a long row of Army bombers & fighters at Luke Field (courtesy of Ford Lauer). An October 10, 1930 aerial view of biplane fighters & bombers (Keystones?) at Luke Field on Ford Island (courtesy of Bill Roberts). A January 1934 aerial view looking west at Consolidated P2Y-1 of Patrol Squadron VP-10F at NAS Ford Island. These 6 aircraft had made a record-setting non-stop flight from San Francisco to Pearl Harbor on 1/10/34, covering 2,085 NM in 24 hours. 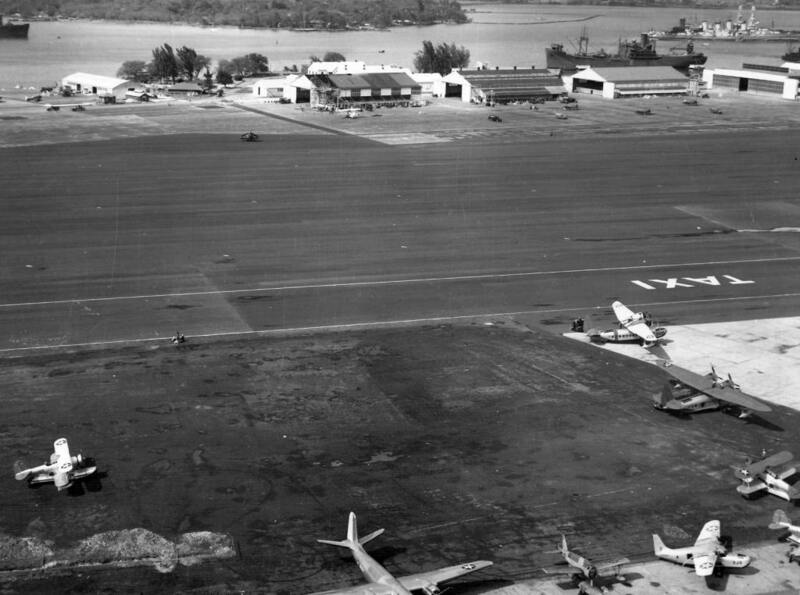 after the Army Air Forces moved to newly-constructed Hickam Field. Pearl Harbor Naval Air Station at Luke Field was the headquarters of the commander of the Pacific Fleet Air Forces. A 10/30/41 U.S. Navy aerial view looking south at Ford Island (courtesy of Brian Rehwinkel). 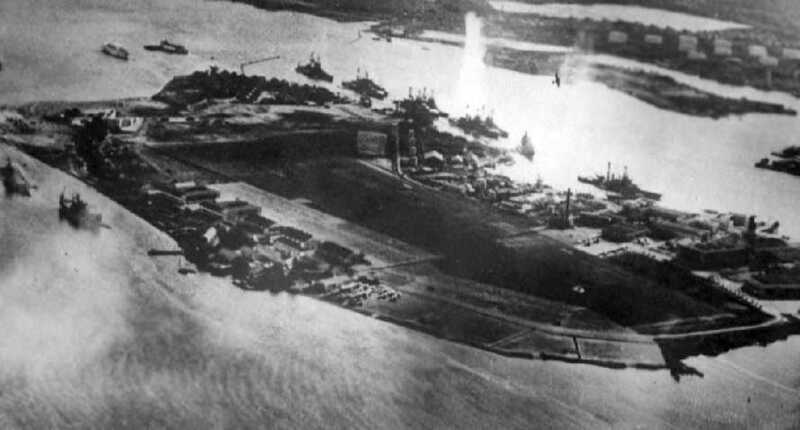 A Navy aerial view of Ford Island, taken on 11/10/41, less than a month before the Pearl Harbor attack. taken during the Pearl Harbor attack. 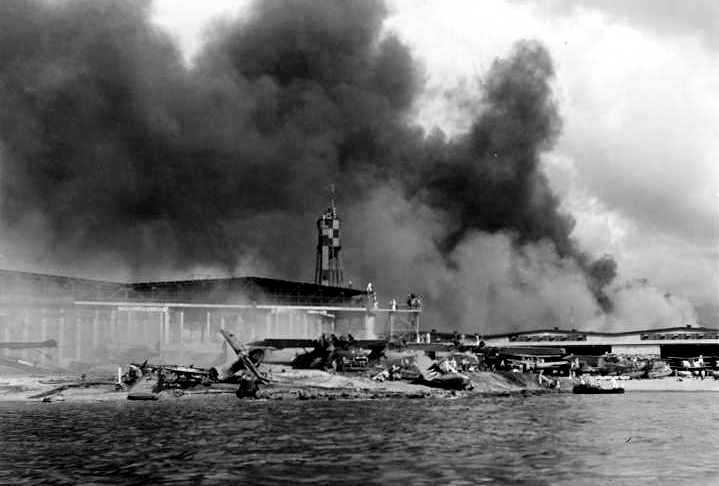 Ford Island was bombed & strafed during the 12/7/41 Japanese attack on Pearl Harbor. where many battleships were attacked & sunk. 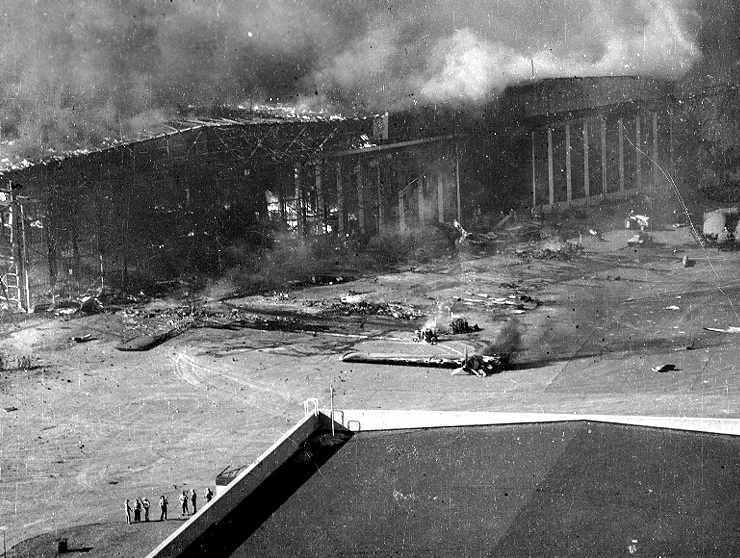 Burning planes & hangars at Ford Island, after the 12/7/41 Pearl Harbor attack. Smoke billows above the Ford Island hangars after the 12/7/41 Pearl Harbor attack. a Vought OS2U Kingfisher without an engine, and the tail of a rare Douglas R3D (DC-5). 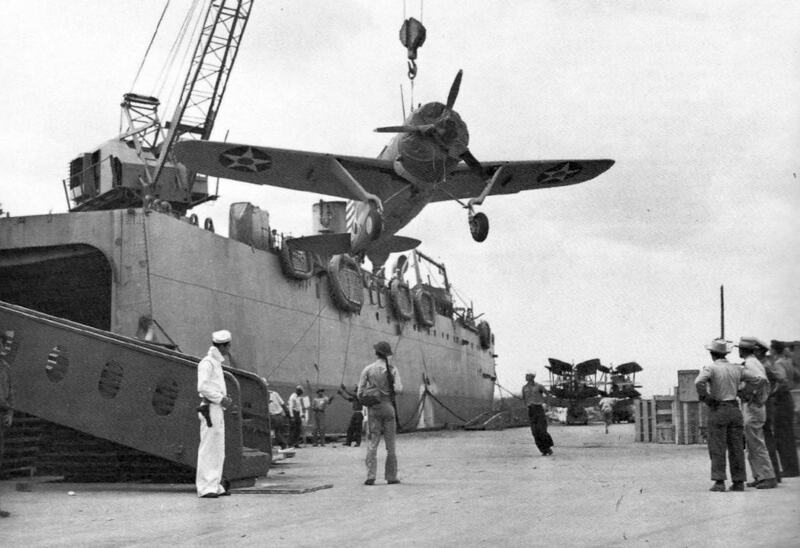 A March 1942 photo of a Brewster F2A-3 Buffalo being craned off of the USS Kitty Hawk at NAS Pearl Harbor (courtesy of John Voss). showing a large number of seaplanes on the ramp & smaller landplanes nearer the runway. 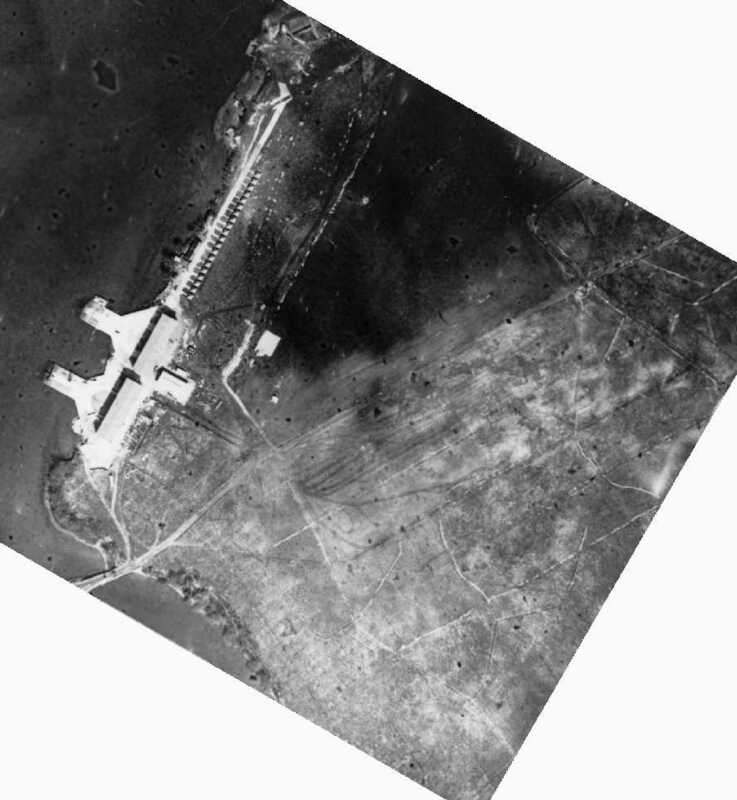 A remarkable 9/5/44 U.S. Navy aerial view of Ford Island (National Archives photo, courtesy of Brian Rehwinkel). Brian Rehwinkel observed, “It is in stark contrast to the earlier photos of the field. there were an unbelievable number of airplanes on this small (334 acres or so) island. I could not count all of the planes on the island, but I counted over 1,000 planes before I stopped counting. You can see a couple of carriers loading (or unloading) planes, but it appears many planes are being 'stored' with their wings folded. With the exception of some photos of post-war fields that were used to store thousands of planes, I have never seen so many planes at an airfield. It almost seems as though the island would sink under the weight of all of the planes. 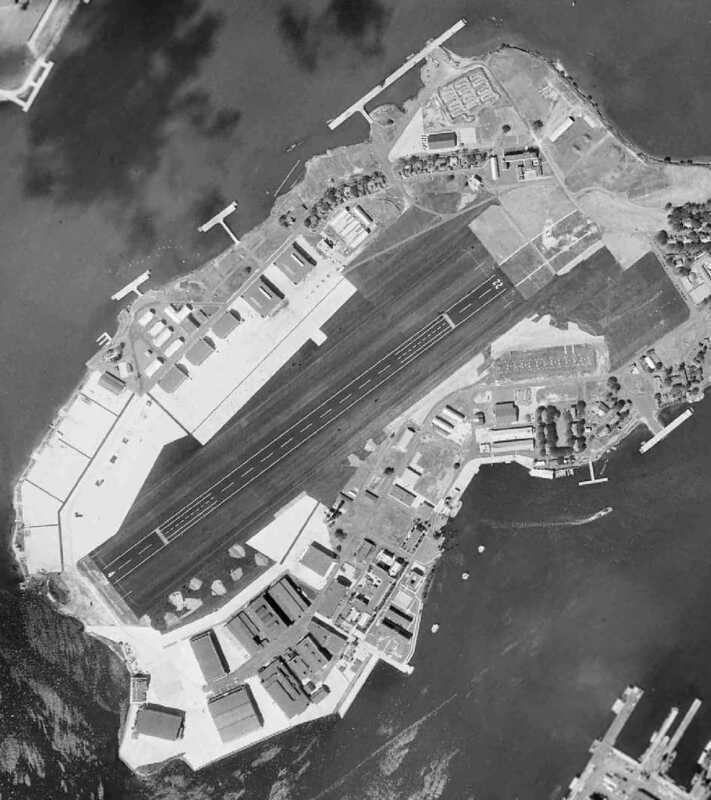 showing some of the thousand planes visible parked on the compact island airfield. as if the Japanese didn't know where Ford Island was by that point! depicted the airfield at Ford Island as having a control tower. 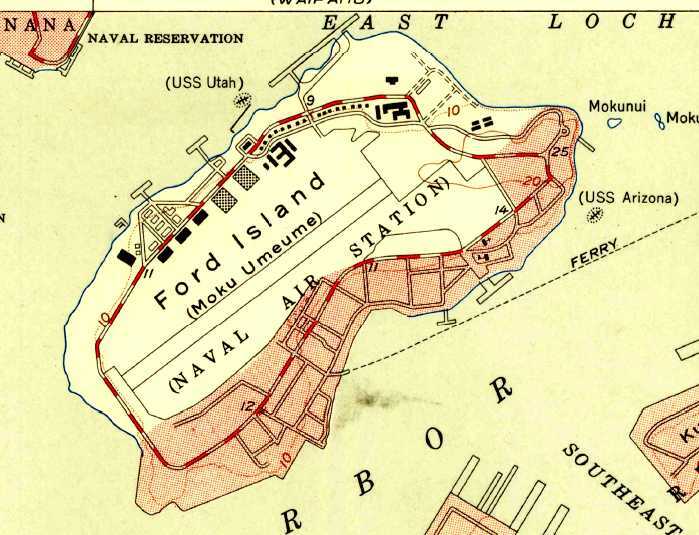 The 1953 USGS topo map depicted Ford Island Naval Air Station as having a single paved runway. A January 19, 1959 aerial view (from the University of HI) did not show any aircraft present on Ford Island. Ford Island as depicted on the 1961 Honolulu Sectional Chart (courtesy of John Voss). The USS Arizona memorial was dedicated in 1962 just off the southeast coast of the island. as the short runway had limited the operational use of the facility. However, the airfield continued to be used in later years for operations of light civil aircraft flown by military flying clubs. when a flare went off in the cockpit as he was taking off from that strip. saving the student & himself, but had to spend months in the Tripler Hospital burn unit." as having a single 4,000' paved runway. 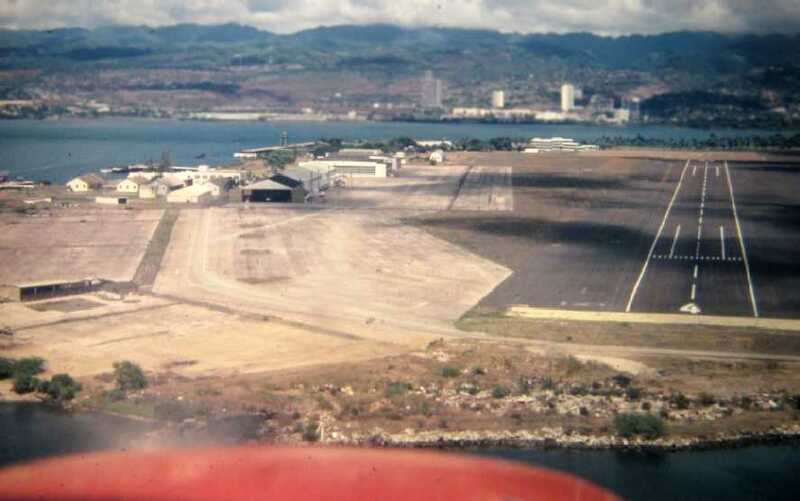 On February 20, 1970 the 4,500' runway at Ford Island was opened to civilian pilots for flight training operations. A September 1980 aerial view by Ron Plante looking north at Ford Island's Runway 4, ramp, and hangars. A September 1980 aerial view by Ron Plante looking northeast at Ford Island's Runway 4, tower, and hangars. with civil operations permitted by prior approval of "any flight school located at Honolulu International Airport." The airfield was said to consist of a single 4,000' paved Runway 4/22. 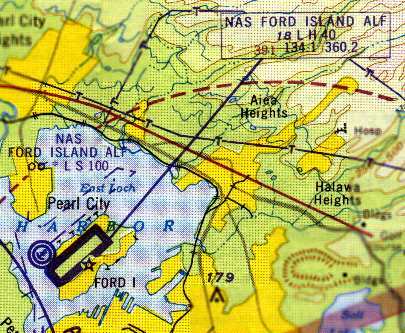 The 1983 USGS topo map still depicted the “Ford Island Naval Air Station”. 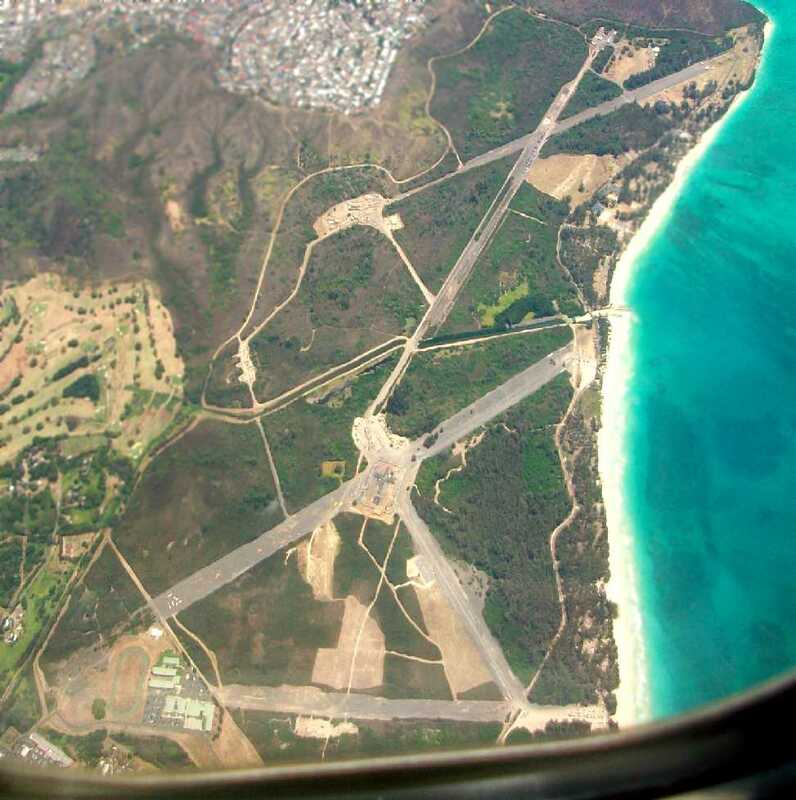 depicted Ford Island ALF as having a 4,000' paved northeast/southwest runway. The completion of the 4,672' long Admiral Clarey Bridge in 1998 made Ford Island readily accessible to visitors for the first time. 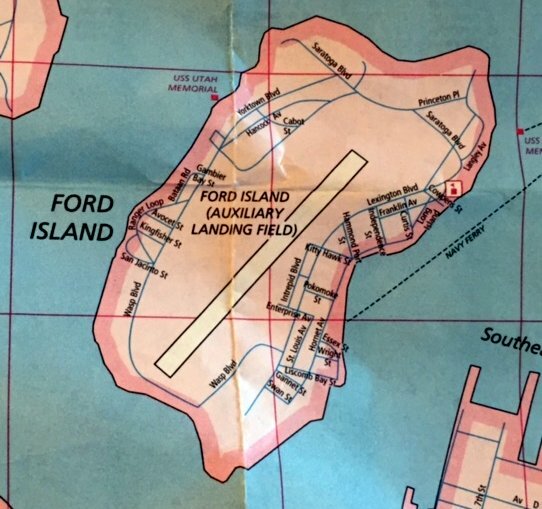 A 1998-99 road map (courtesy of Kevin Walsh) depicted Ford Island (Auxiliary Landing Field) in its final year of operation. to be used for general aviation purposes. 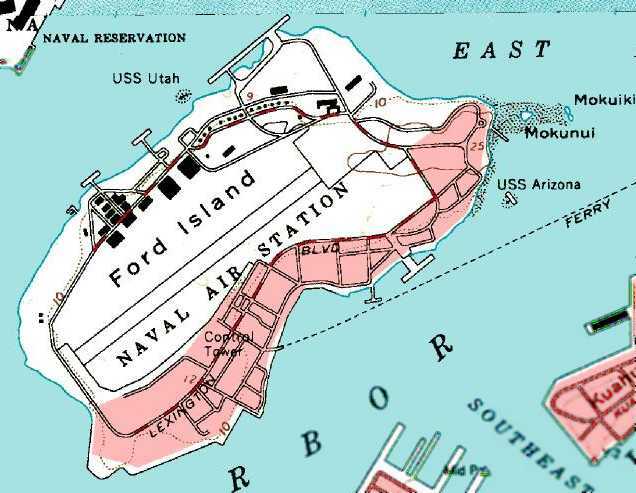 The Navy planned to redevelop Ford Island with a new museum, residential areas, and offices. 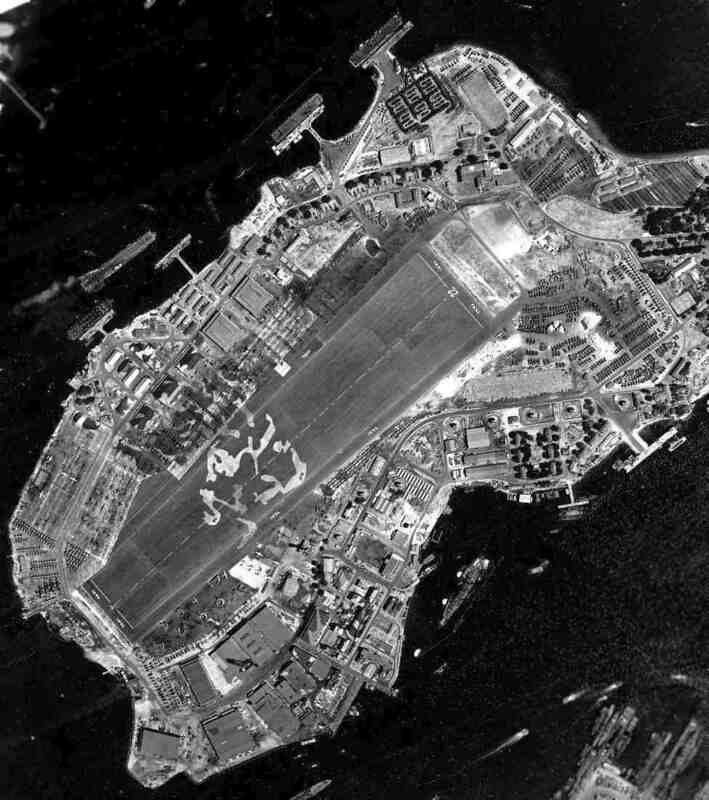 A 2001 aerial view looking northwest at Ford Island. Aerial view of Ford Island in 2002. Note the battleship Missouri moored at pier on the east side. 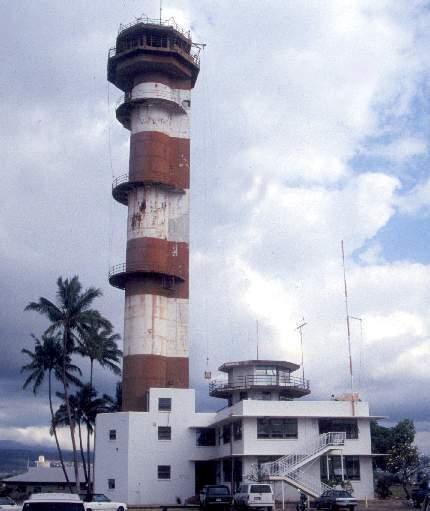 A circa 2002 photo by David Scott of the Ford Island tower. A circa 2002 photo by David Scott of a Ford Island hangar. is working to try to save Ford Island from redevelopment. that can put it to full use without changing it's historical nature. 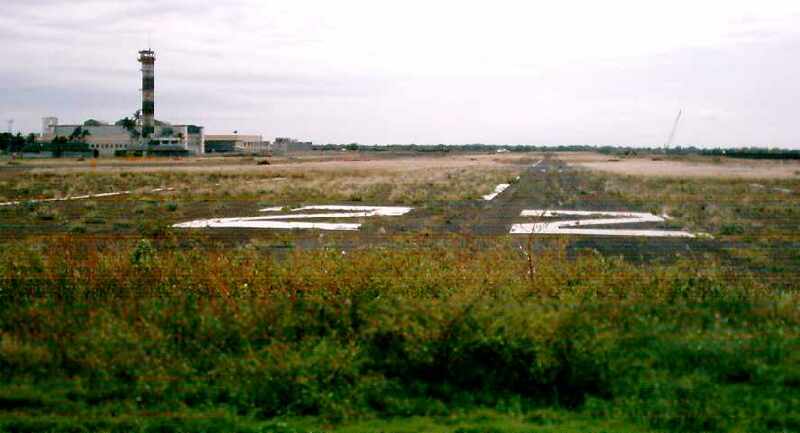 A 2005 photo by Dennis Terek looking along Ford Island's abandoned Runway 22, with the hangars & tower on the left. A 2005 photo by Dennis Terek of the exterior of a remaining hangar at Ford Island. 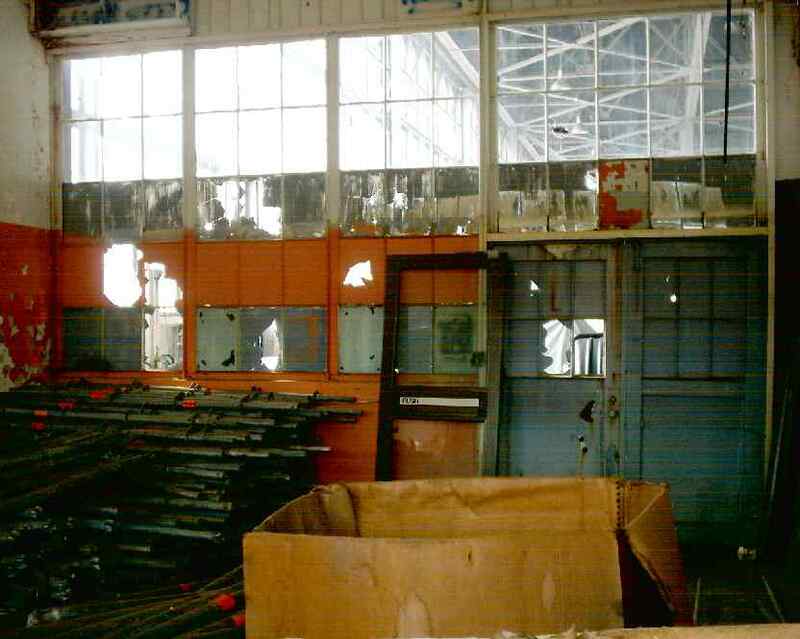 A 2005 photo by Dennis Terek of the interior of a remaining hangar at Ford Island. 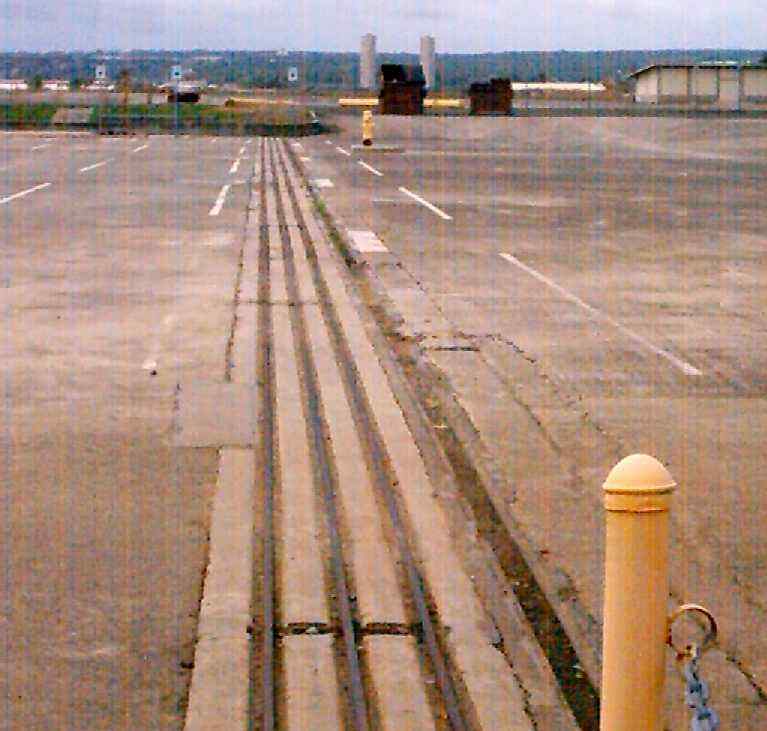 A 2005 photo by Dennis Terek of the hangar door track where Ford Island's Hangar 6 used to be located. 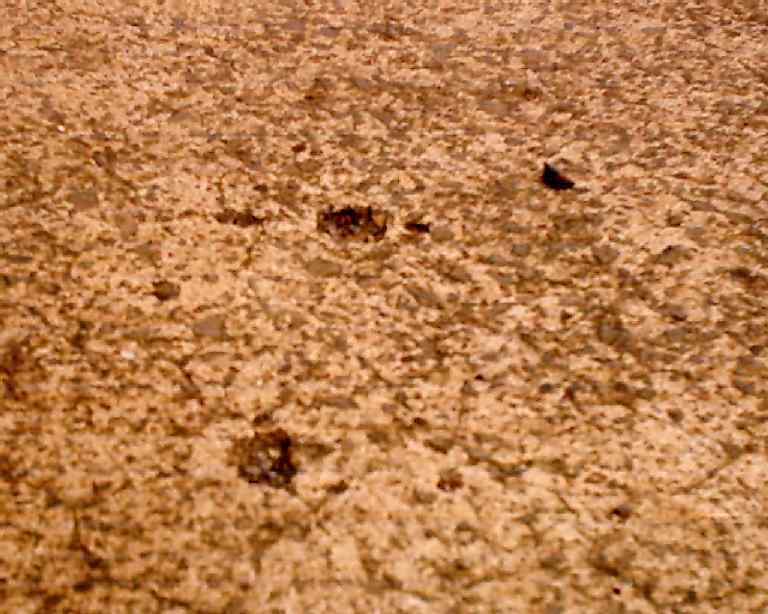 A 2005 photo by Dennis Terek of the strafe marks which remain in the flightline at Ford Island from the Pearl Harbor attack. 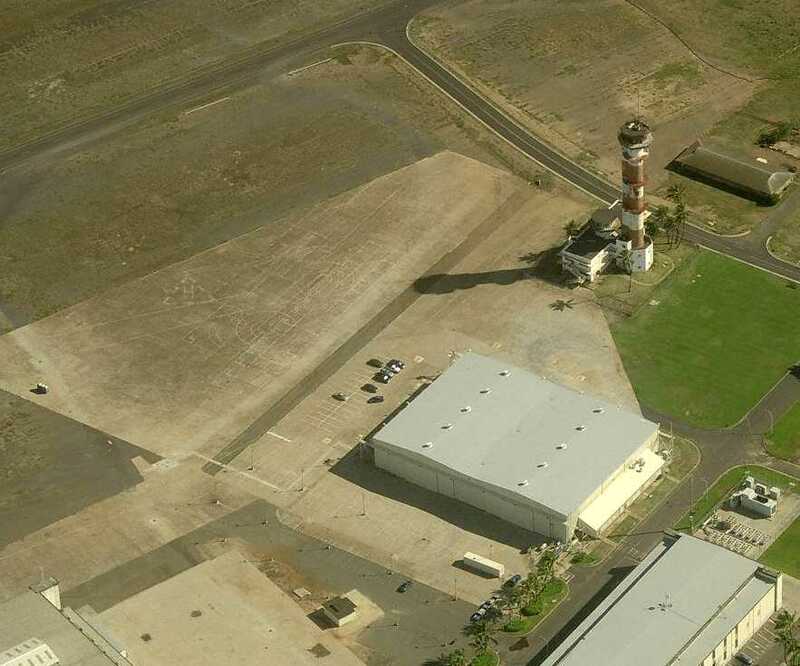 A circa 2006-2009 aerial view looking north at Ford Island showing hangars, the terminal building, and tower. The southern end of the runway surface had been removed, but the “22” numbers are still visible at the northeastern end. 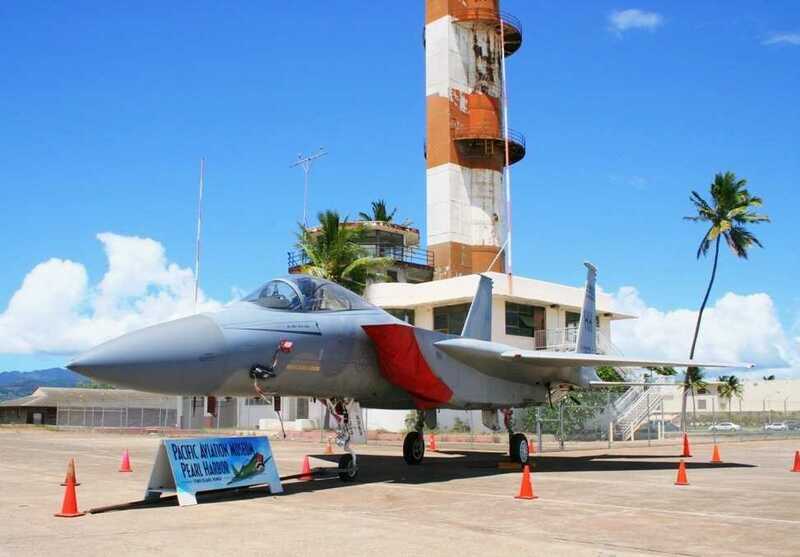 A 7/12/10 photo by Dirk Fierens of a McDonnell Douglas F-15A Eagle of the Pacific Aviation Museum, on display in front of the Ford Island tower. An 8/22/11 photo of a beautifully restored 1952 North American F-86L Sabre, serial #190-596, in front of the Pacific Aviation Museum hangar at Ford Island. In 2012, Barbara Bloom reported, “Ford Island, in the heart of Pearl Harbor, is a site that many have likened to Gettysburg, Valley Forge, and the Alamo. 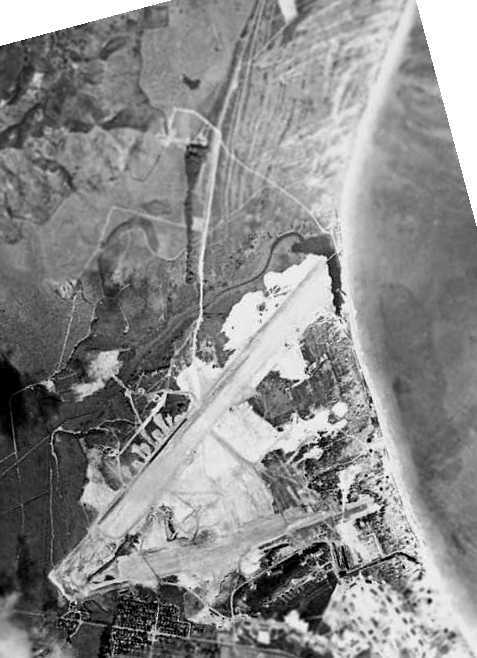 The 4,000’ runway, part of Naval Air Station Ford Island from 1921-61, has long been on the National Register of Historic Places. in a move that will permanently convert the nature & appearance of this hallowed ground to an industrial project. Barbara continued, “To date the [Pacific Aviation Museum] has welcomed more than 800,000 visitors. and preserve Pacific region aviation artifacts. The museum feels that the Ford Island runway is one such artifact. This project is not at all in keeping with the significance of the historic Pearl Harbor battlefield. 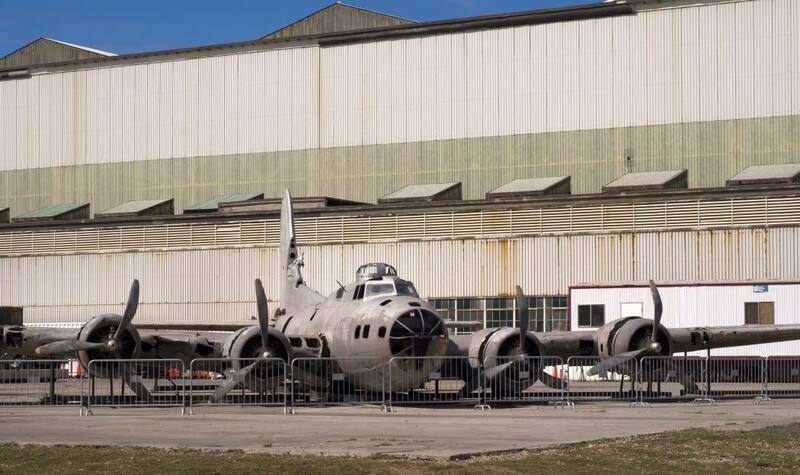 which crashed landed after being attacked in WW2, and sits outside the Pacific Aviation Museum awaiting restoration. An 8/24/14 photo by Timothy Williamson of the Ford Island tower. An 8/24/14 panoramic photo by Timothy Williamson of the Ford Island ramp, showing a Douglas NTA-3B Skywarrior & the nose section of a Boeing B-52E Stratofortress. (courtesy of the 15th Airlift Wing History Office, via Colin Perry of the Hawaii Aviation Preservation Society). This site was established in 1917 as the Waimanalo Military Reservation, an infantry training area. It was renamed Bellows Field in 1933. It originally had a single asphalt runway (only 983' long), and a wooden tower. 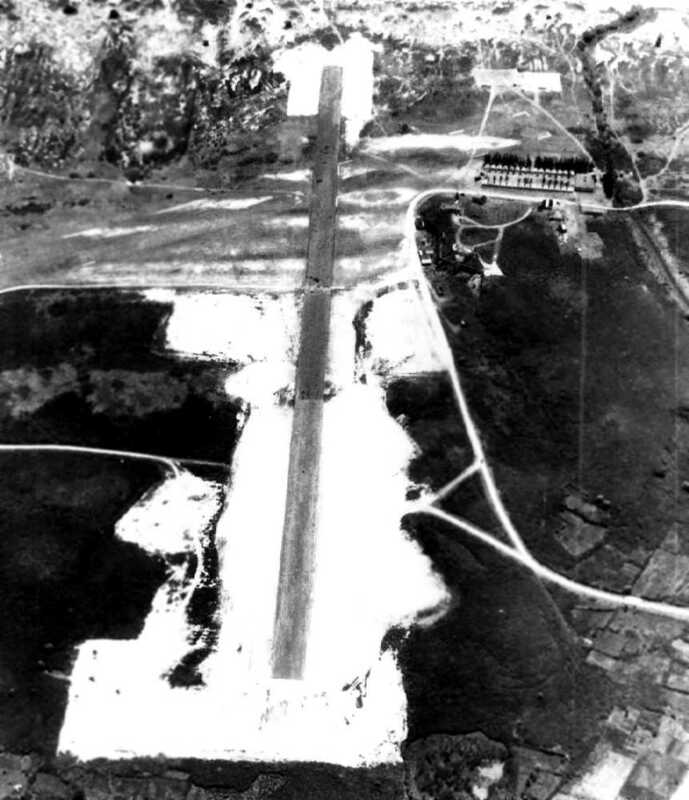 A July 26, 1938 aerial view depicted the single paved runway at Bellows Field. 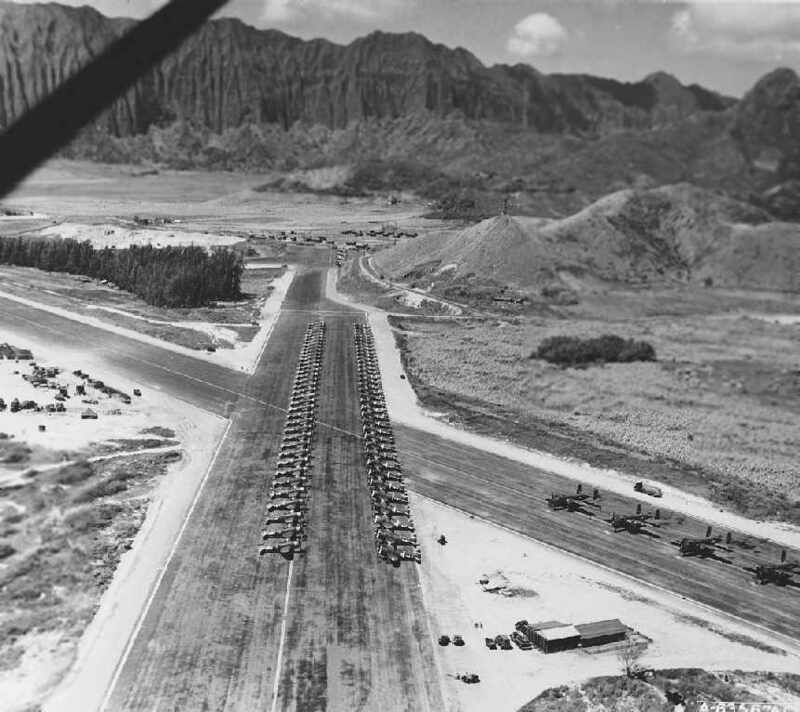 A major construction program began at Bellows in 1941, including the construction of a new & larger runway. A dozen P-40 Warhawk fighters were assigned to the field for training. A 1941 photo of a Stinson O-49 Vigilant observation aircraft at Bellows Field, with the dramatic mountains in the background. 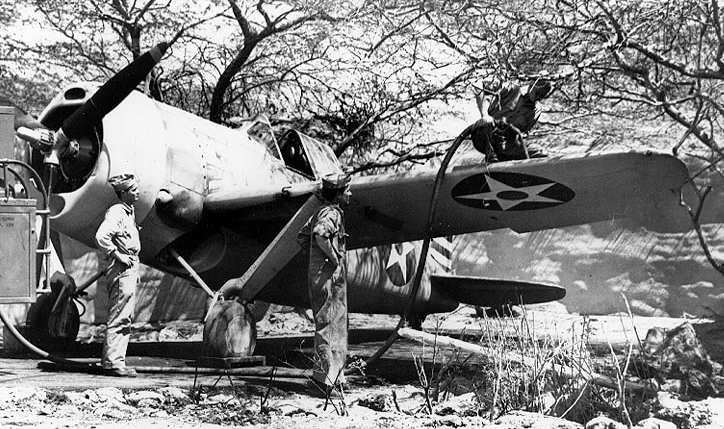 A P-40 Warhawk at Bellows Field, damaged in the Japanese attack of 12/7/41. 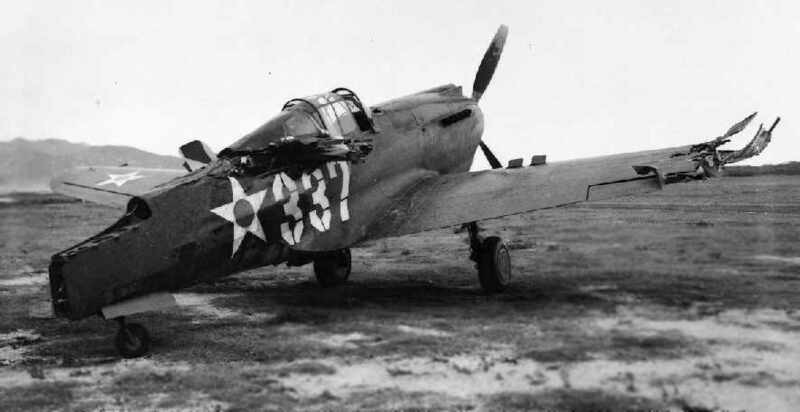 Two P-40 pilots were killed by strafing Japanese fighters as they attempted to take off from Bellows. 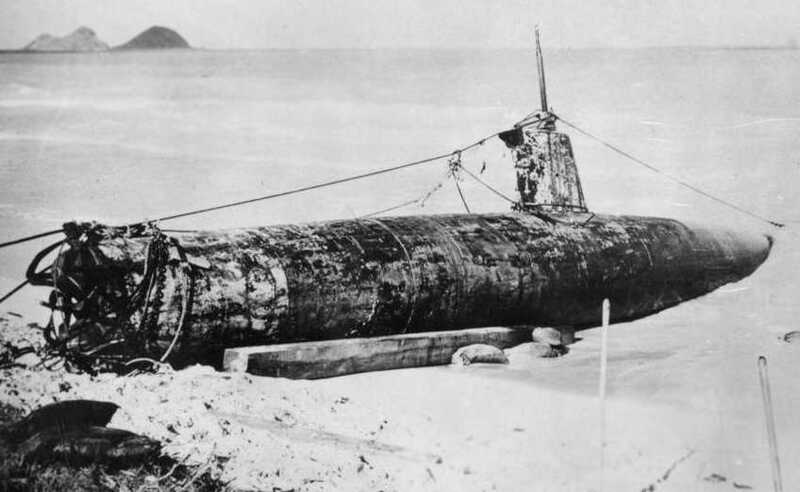 A 1941 photo of the Japanese midget submarine which was found beached on the shore at Bellows Field after the Pearl Harbor attack. It had been launched by the I-24 mother sub & arrived off the entrance to Pearl Harbor on 12/6/41. It was grounded off Bellows Field the next day. Its commander, Ensign Kazuo Sakamaki, swam ashore on 12/8/41 & was captured. The sub was 80' long, 6' in diameter, had a 46 ton displacement, and was battery-powered by a 600 hp motor. 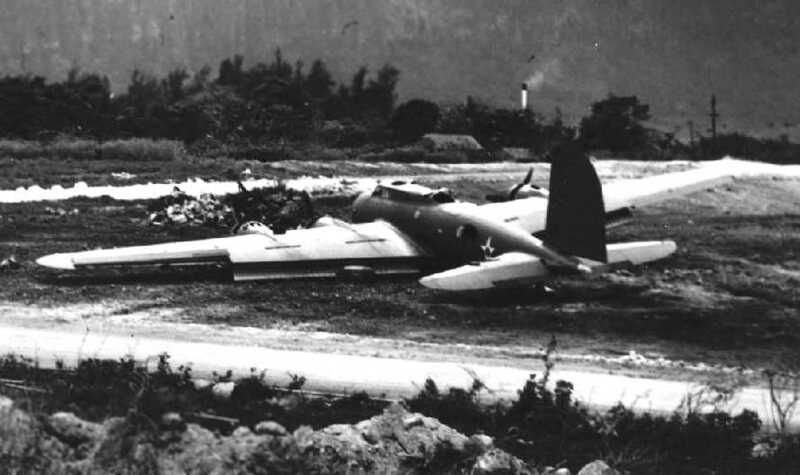 A 1941 photo of a B-17C Flying Fortress bomber which had made a belly landing on the relatively short Bellow Field runway. It was one of a dozen B-17s which had arrived from the mainland & was unable to land at Hickam Field due to the Pearl Harbor attack. 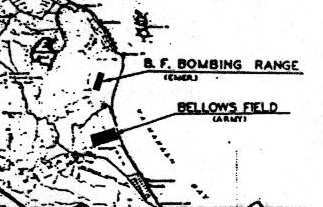 "Bellows Field Bombing Range (Emergency)" to the north & "Bellows Field (Army)" to the south. 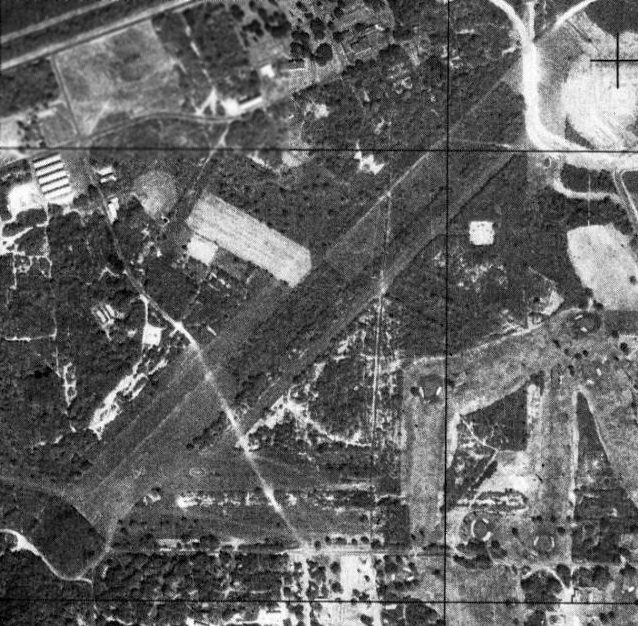 The second airfield was apparently added at some point between 1942-43. 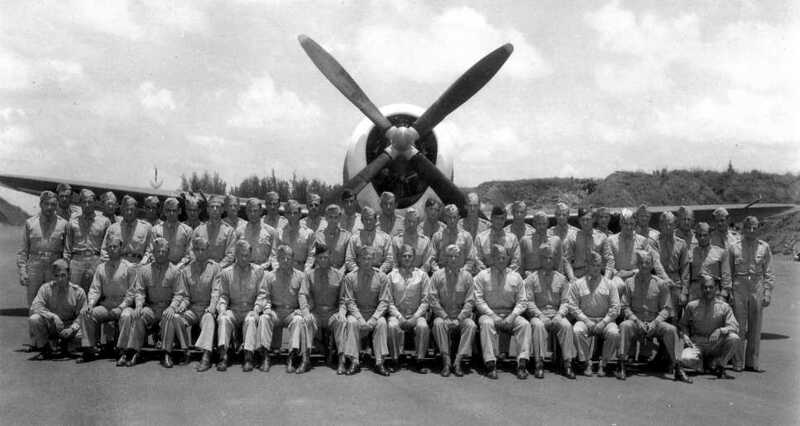 A 1944 photo of the members of the 318th Fighter Group's 73rd Fighter Squadron in front of one of their P-47 Thunderbolts at Bellows Field. 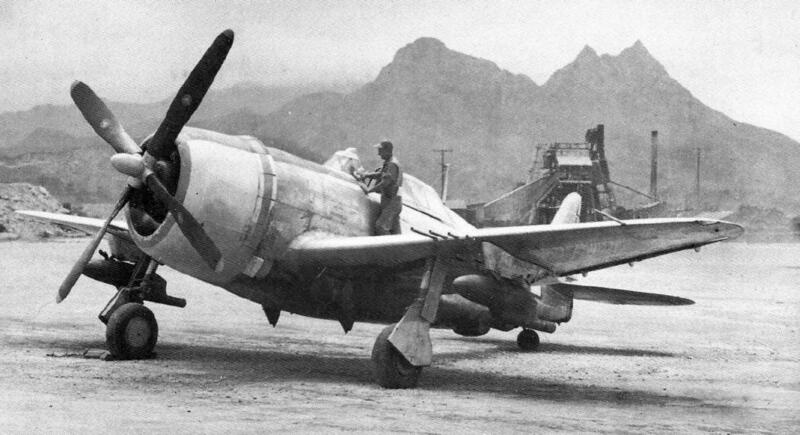 A WW2 photo of a Republic P-47D-23-RE Thunderbolt at Bellows Field (courtesy of John Voss), equipped with smoke-generating tanks mounted on the wing racks. 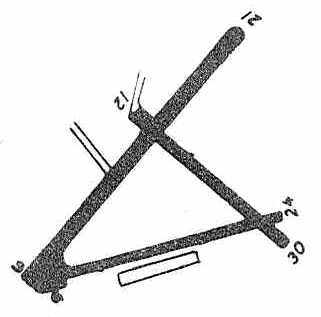 appeared to depict the Bellows as having 2 different towers (for its 2 airfields): “Bellows” & “Scramble”. as having a 6,200' hard-surface runway. 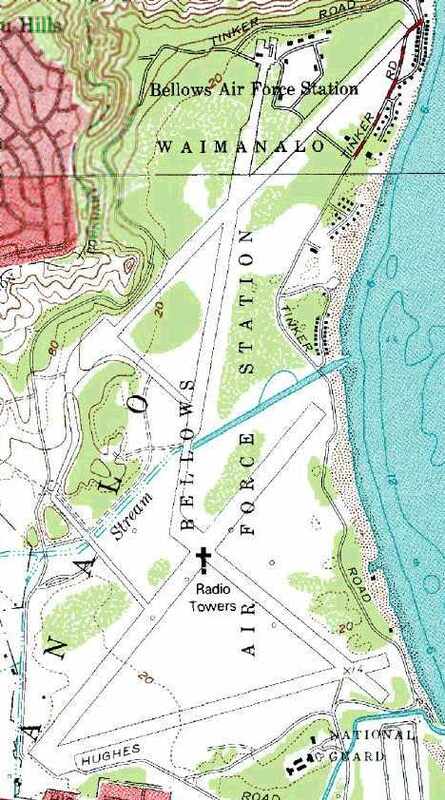 The 1952 USGS topo map depicted Bellows Air Force Base as having 4 paved runways. 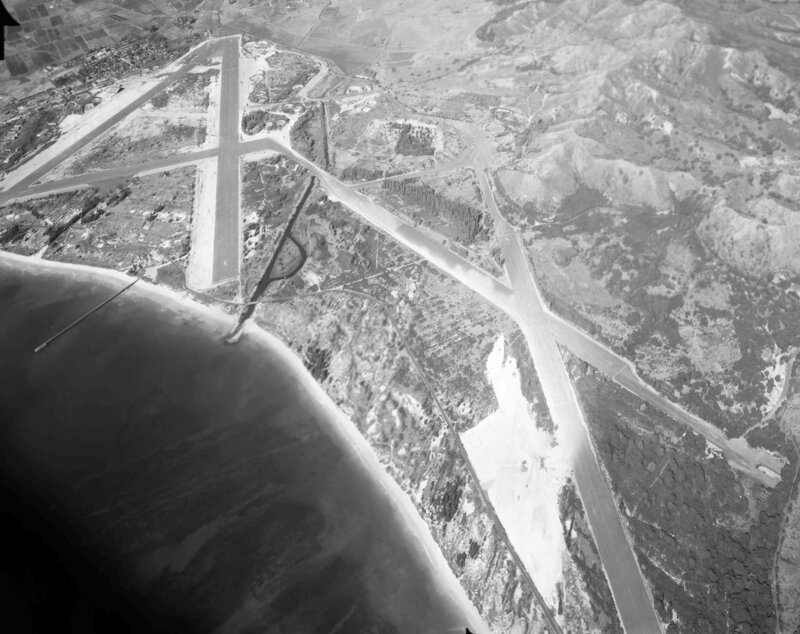 A February 1952 aerial view looking southwest at the Bellows runways (from the University of HI). depicted Bellows' south field as having 3 paved runways, with the longest being the 6,290' Runway 3/21. 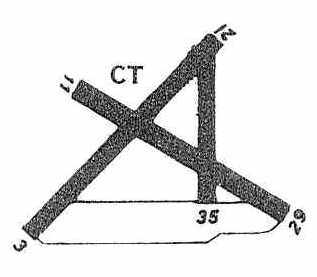 depicted Bellows as having 2 distinct airfields, connected by a taxiway (most likely dictated by geographic constraints). 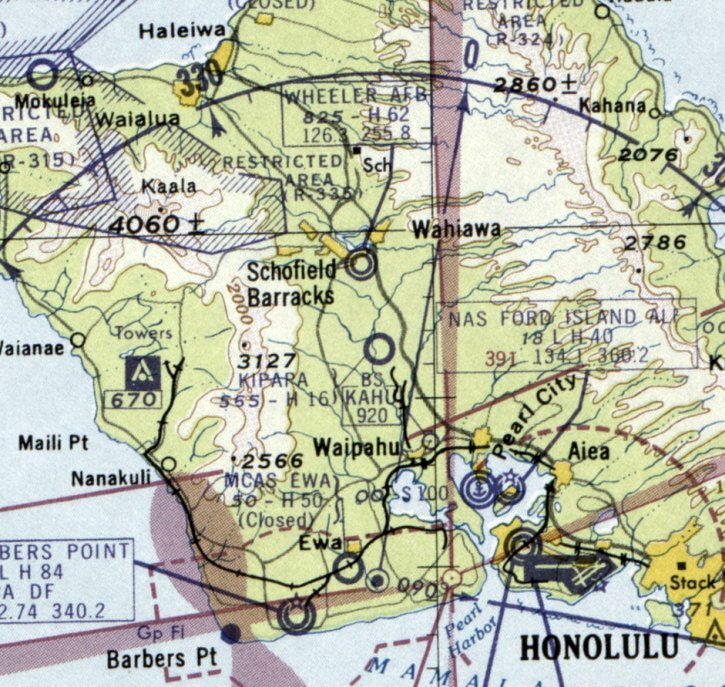 The north Bellows airfield was labeled as "(closed)" on the 1955 Honolulu Local Aeronautical Chart (courtesy of Chris Kennedy). 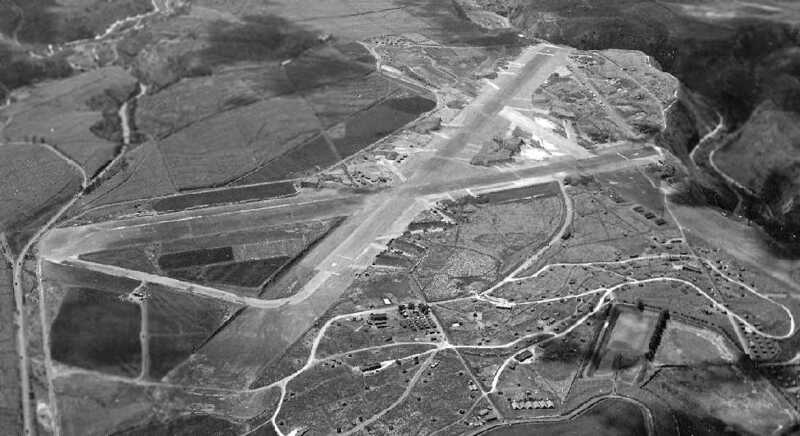 However, the south Bellows airfield may have been used for some period during the 1950s as a civilian airfield of some type. 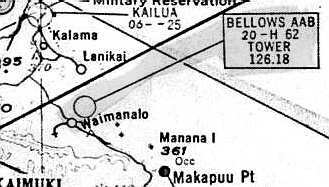 The 1955 Honolulu Local Aeronautical Chart labeled the south field simply as "Bellows", without any kind of military designation. In the Aerodromes table on the chart, the type of the airfield is listed as "Ltd" - what did that mean? The field is described as having a total of 5 runways, with the longest being a 6,290' asphalt strip. The field was also described as "Not attended". 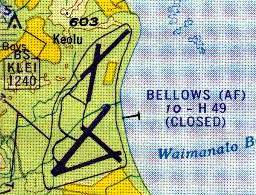 The runways at Bellows were eventually closed in 1958. Bellows as depicted on the 1961 Honolulu Sectional Chart (courtesy of John Voss). part of a network of 4 Nike surface-to-air missile batteries in Oahu. 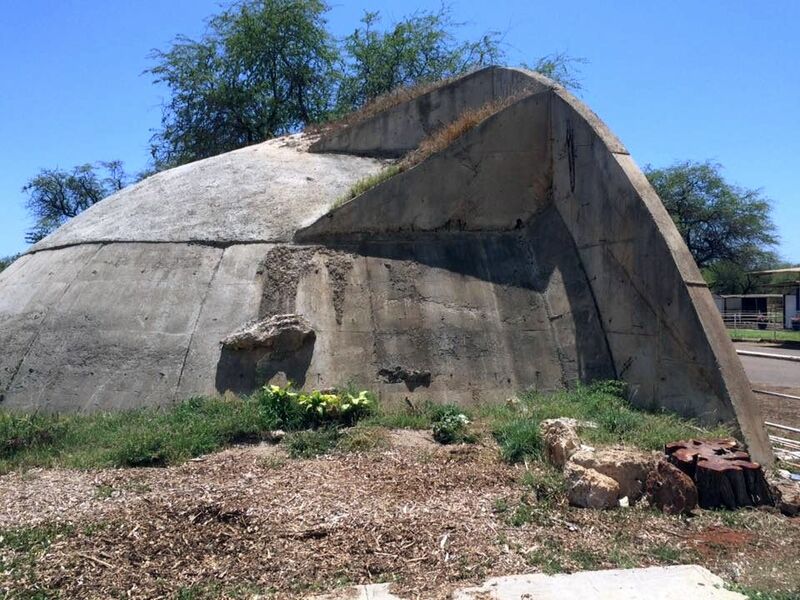 The Bellows Nike battery was different from many of those on the mainland U.S.
in that the NIKE missiles at the Bellows battery were kept above ground. The Bellows battery was also a "double" battery, having 2 rows of 12 missile launchers. from the September 1962 Hawaii Guardsman. 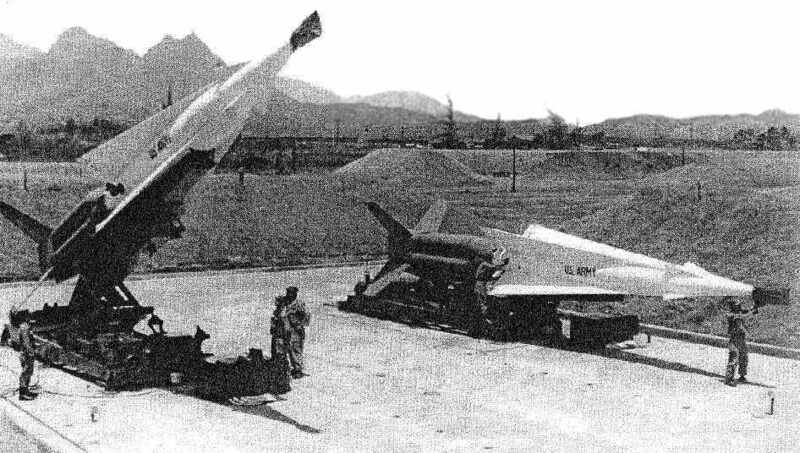 An undated photo of 2 Nike Hercules missiles on their launchers at Bellows, from the December 1963 Hawaii Guardsman. plus other structures (I lived in the area so was privy to what was happening on top of the mountains - in plain sight). This area appeared to be a secure military reservation. I am guessing that these were special radars related to the Nike-Hercules site for target tracking & prosecution, whether potential Soviet bombers or incoming ballistic missiles? The site did not stay active for too many years & was deconstructed about the time that the missile battery was shut down. 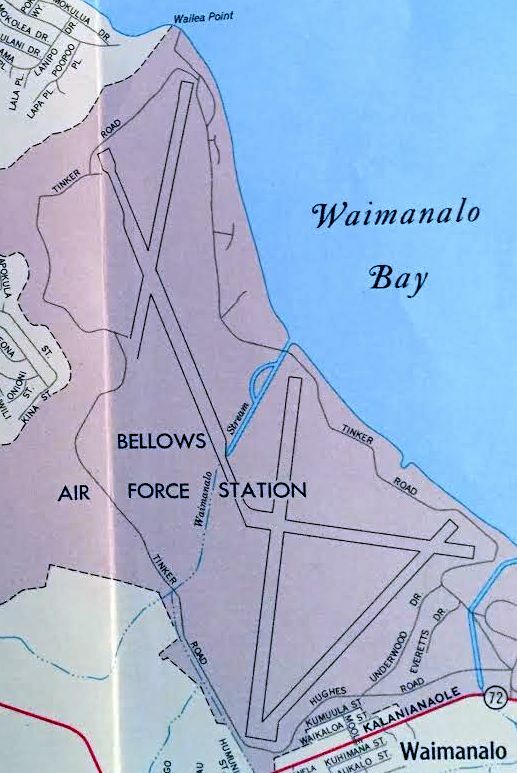 The Bellows property was renamed Bellows Air Force Station in 1968. 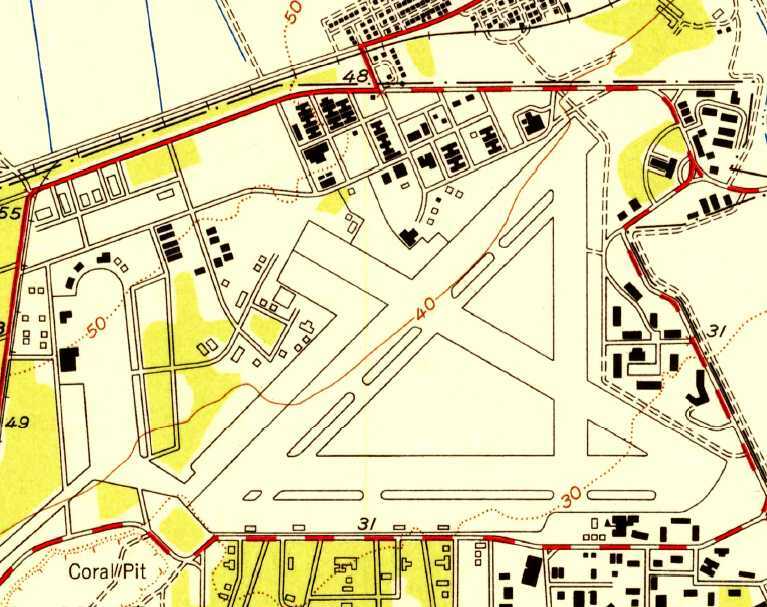 A 1968 street map (courtesy of Kevin Walsh) depicted Bellows Air Force Station as having 4 runways. 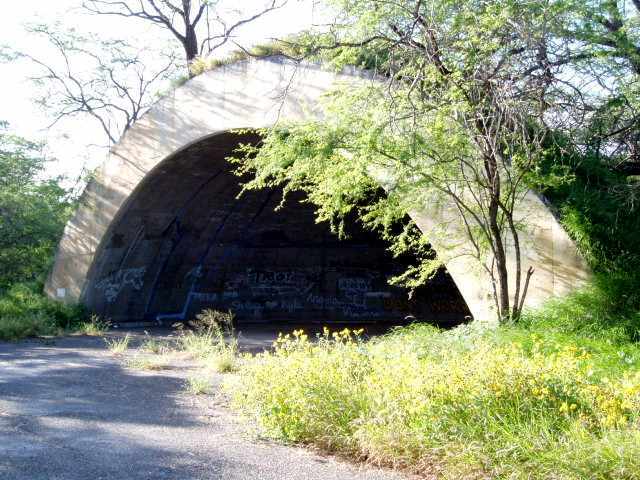 The Bellows OA-32 Nike missile battery was deactivated in March 1970. 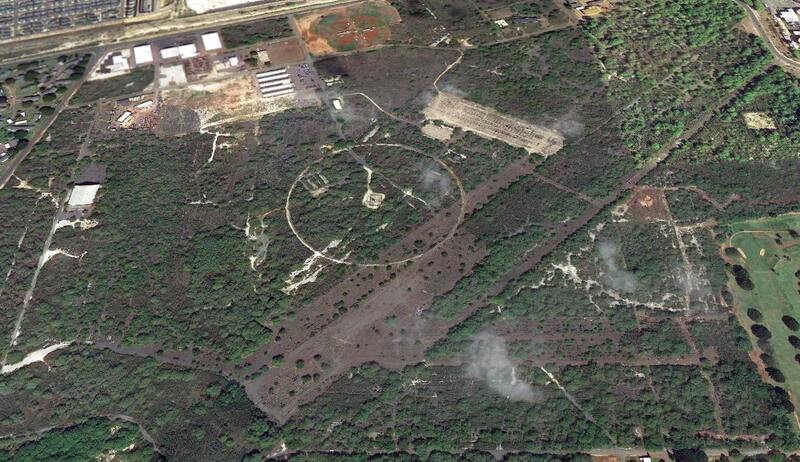 The Bellows Nike site is very well preserved, because of its location on a military installation. to study the possibility of reopening one of the Bellows airfields for general aviation use. Marine assault training that is conducted by the Marine Corps." for combat training to include simultaneous air & amphibious beach assaults. and amphibious training on 50 days. and its beach access for the some 550 acres of training area." 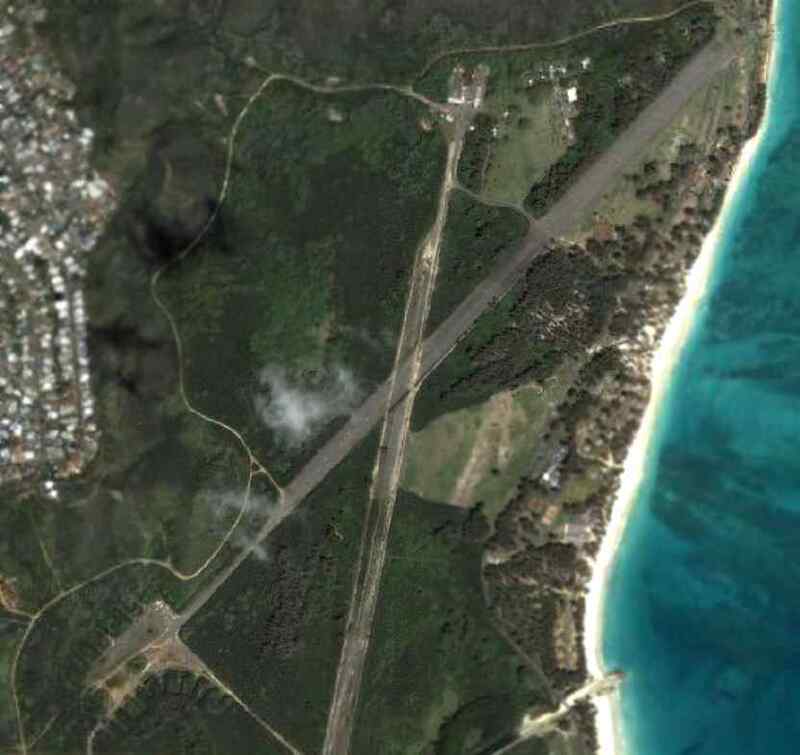 The H. H. Aerospace Design Company report continued, “Bellows AFS has 5 inactive runways. Three southern runways (6/24, 12/30, 3R/21L) and 2 northern runways (18/36 & 3L/21R). These runways are severely deteriorated & not usable by fixed wing aircraft. The station contains a communications transmitter facility. [these antenna are no longer in service & have subsequently been removed]. The Bellows Recreation Center is operated by Detachment 1, 15th Air Base Wing. The center is composed of 102 beach cottages, a small exchange & a beach club. The Recreation Center & its support facilities occupy 154 acres. 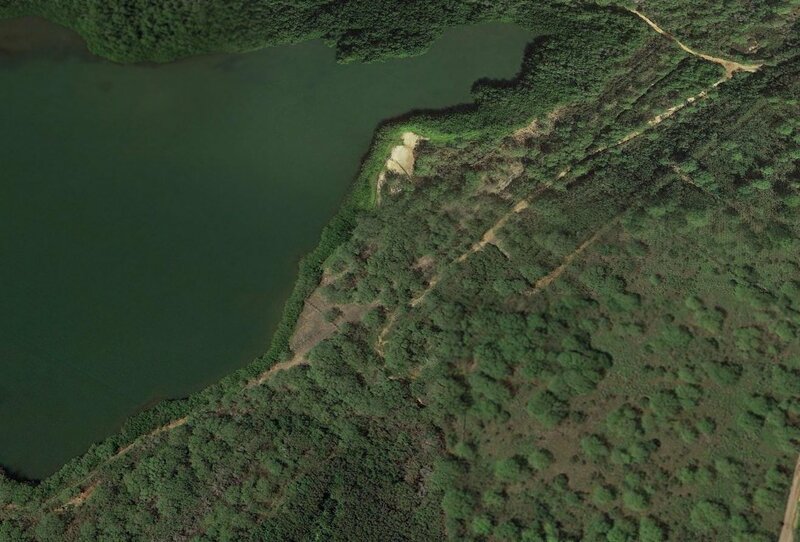 to allow the general public to use approximately 54 acres of those acres for swimming, picnicking & camping. Such use is limited to weekends & holidays." and its beaches are operated as a recreation facility for military families. 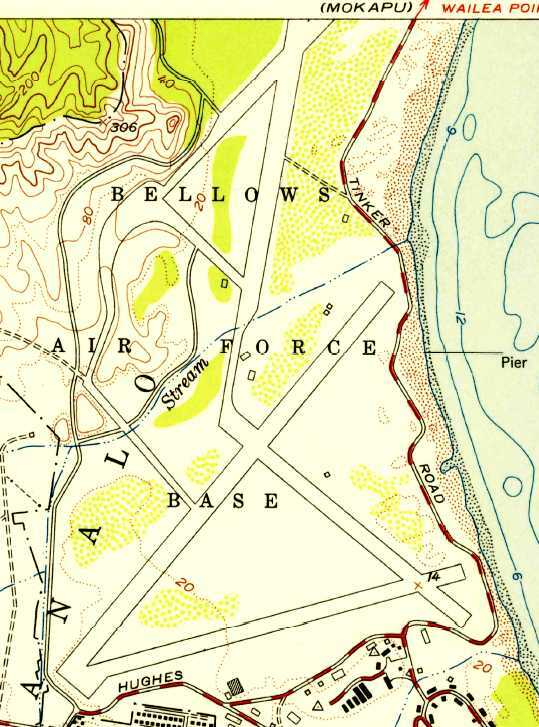 Bellows was still depicted as an abandoned airfield on recent Sectional Charts. A circa 2000-2005 USGS false-color photo of the remains of the 2 Bellows airfields. A circa 2000-2005 USGS aerial photo of the northern half of the Bellows airfield. A 6/15/12 aerial view by Donald Russell looking northwest at the Bellows airfield. An 8/23/14 photo by Timothy Williamson looking northwest along a Bellows runway.